To order, email for invoice. Please give the name and number of the item, and the country to which it is to be shipped. Check my eBay listings here. 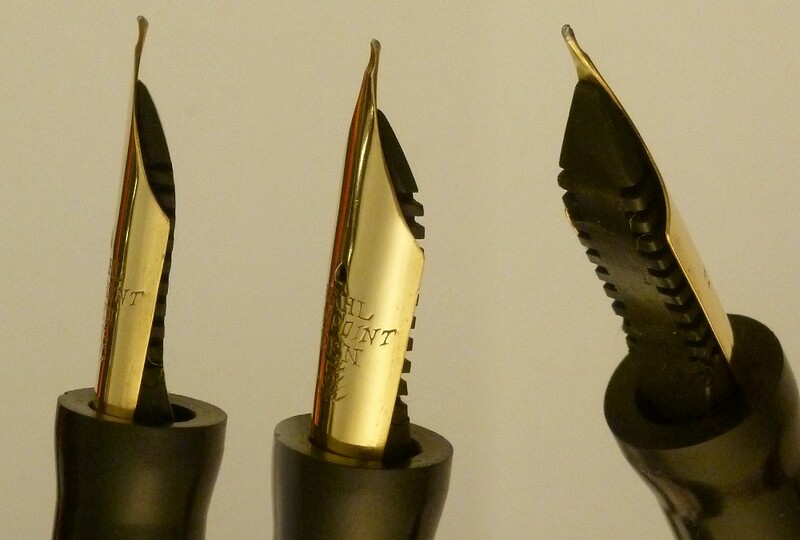 Dip pens offer some of the most impressive nibs on the planet: they're often very flexible and very fine. 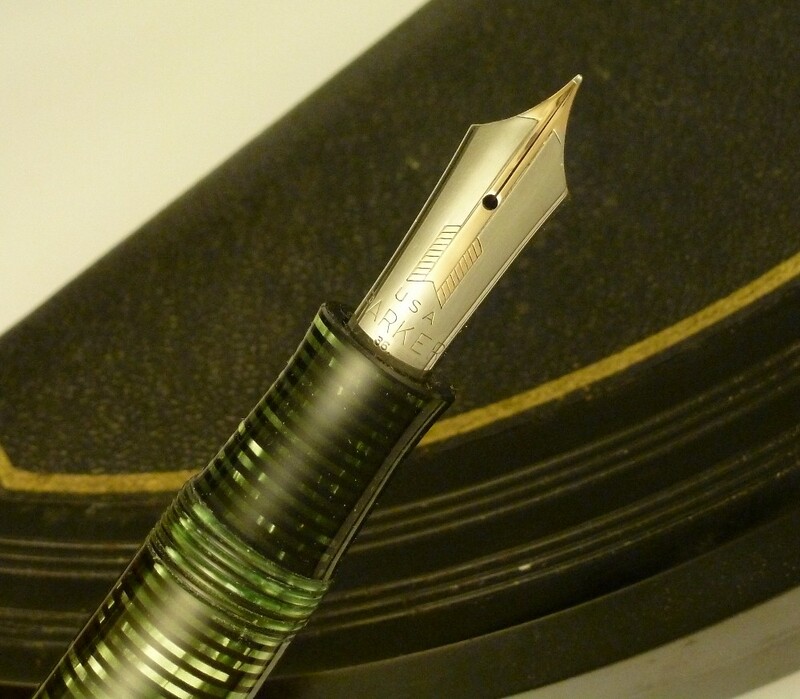 Unlike the calligrapher's ideal, the steel dip nib, they also have iridium on the tip. 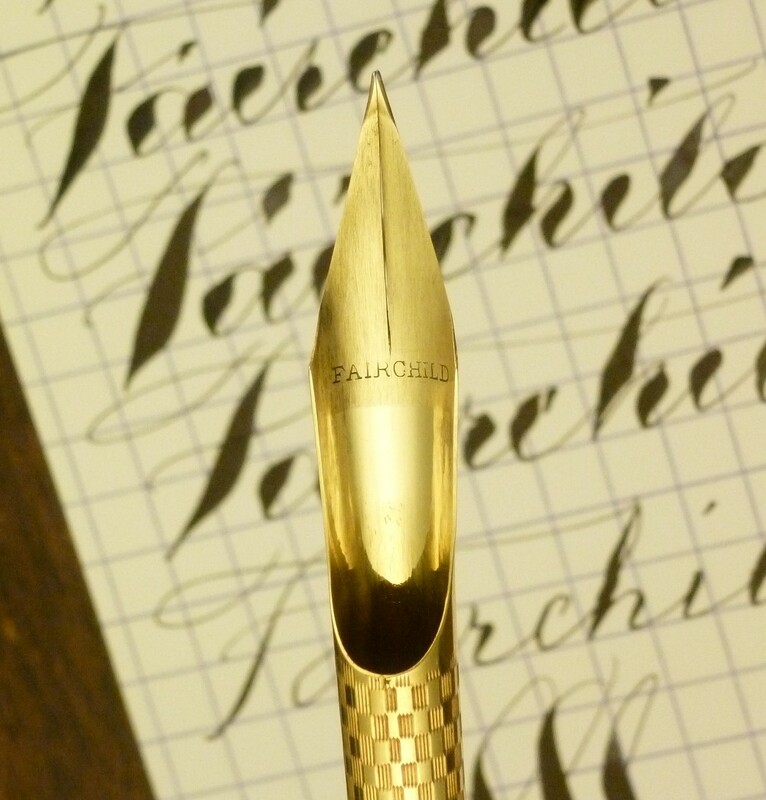 This Fairchild dip pen has that plus everything else you'd want in a dip pen: it's a very large size, and it's made in that unusual configuration that's sometimes called 'bishop's hat'. The nib and section are all one piece, an elegantly tapered and elongated scoop shape that fits directly onto the wooden taper. 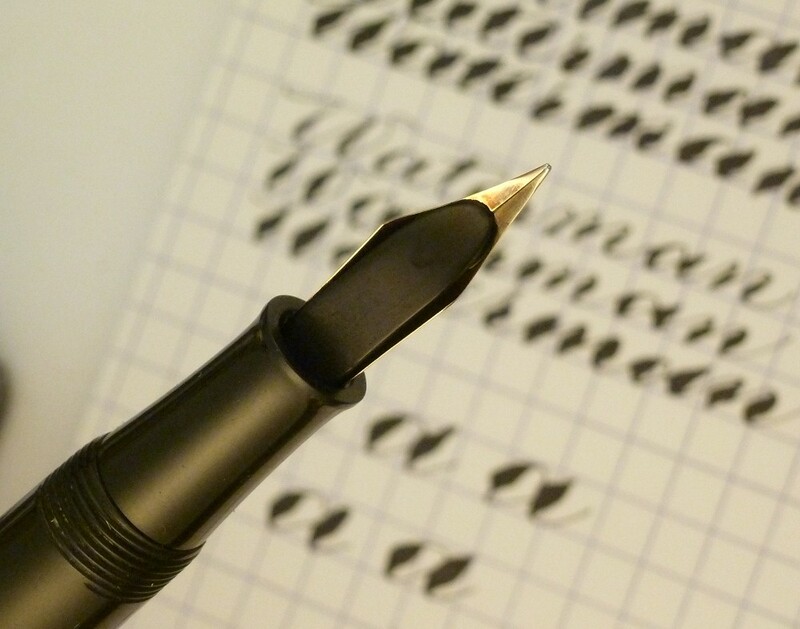 The writing qualities are unequalled: extremely fine and extremely flexible, with swells coming right up to the 3mm mark and hairlines of true steel-dip-nib fineness. 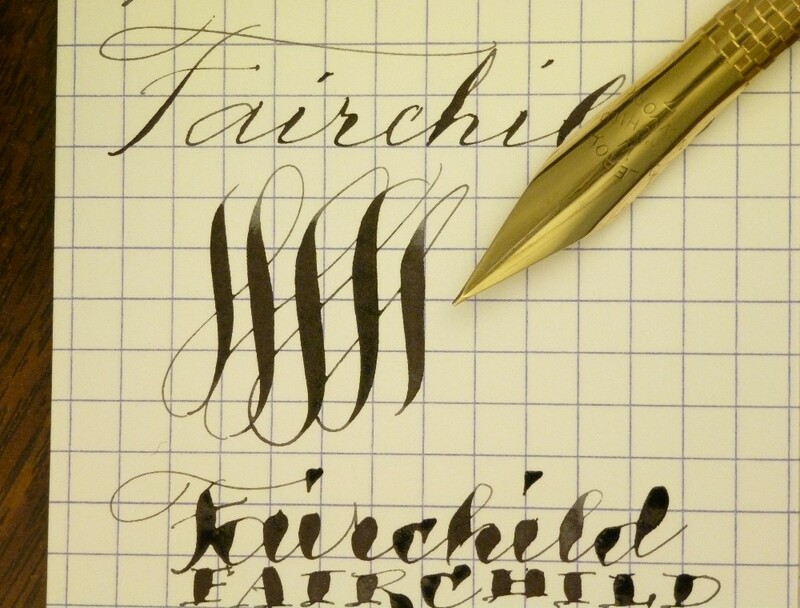 An added treat: the Fairchild name engraved on the inside of the nib. 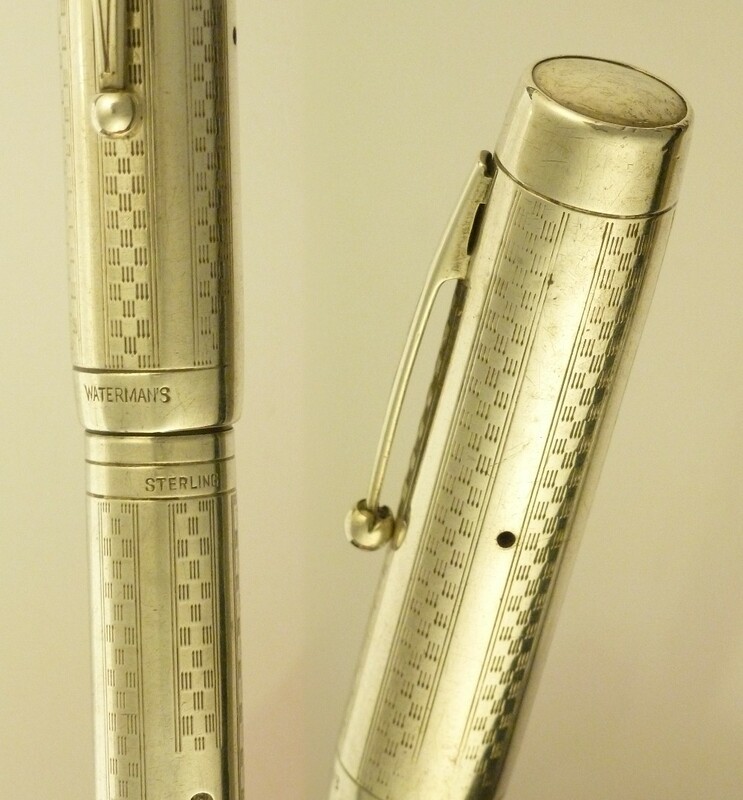 Excellent condition, with one nick on the back tip of the taper. 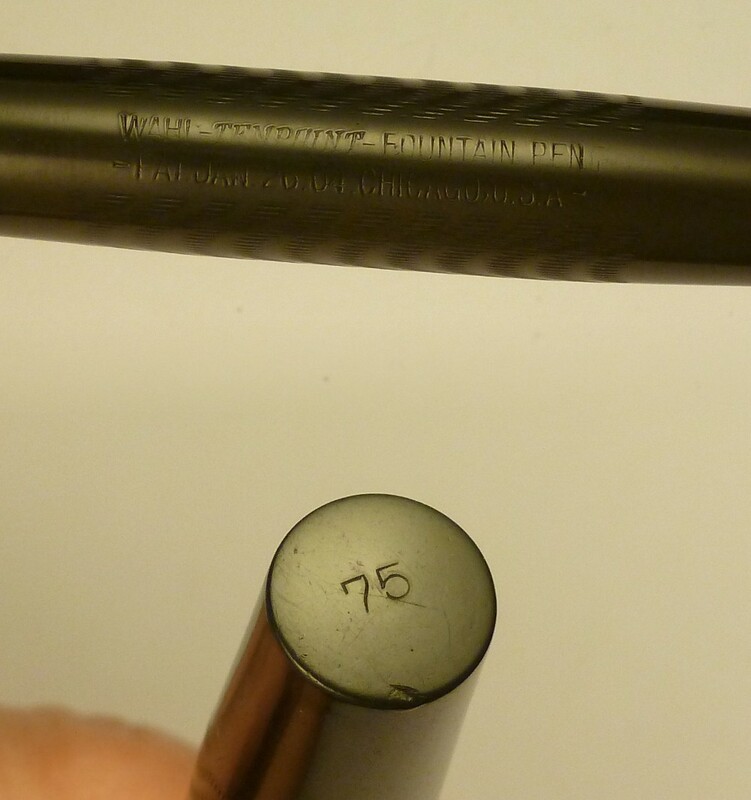 Overall length 175mm. 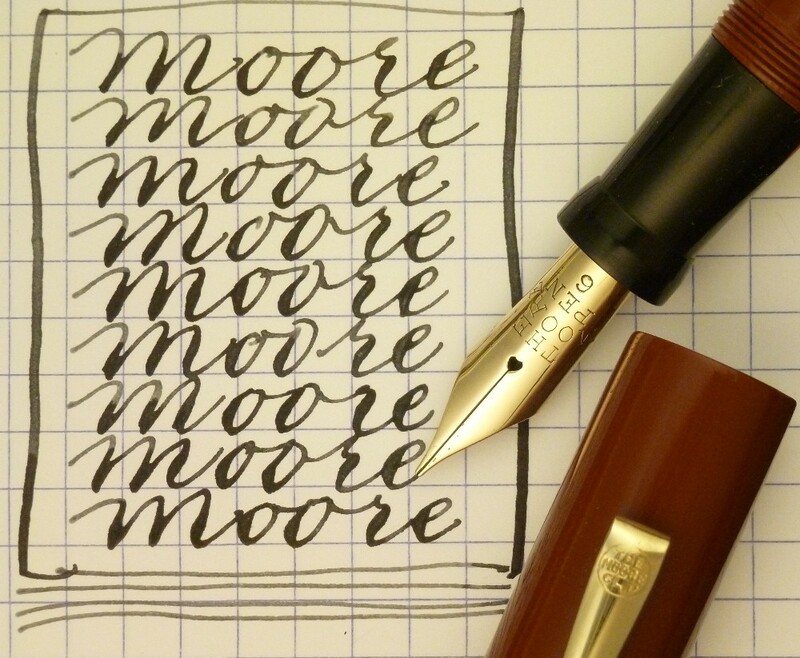 The L-94 was one of Moore's larger pens, slightly bigger than an oversized Sheaffer Lifetime flattop, fitted with the long and elegant Moore No. 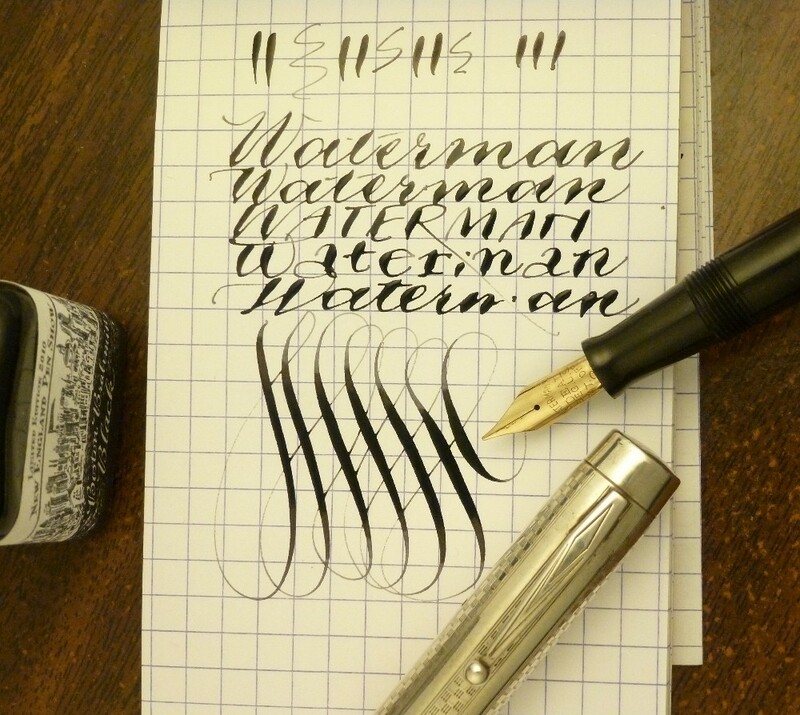 4 nib which, despite the lower number, is comparable to a Waterman 7. Here's an unusual wide-banded chased model. 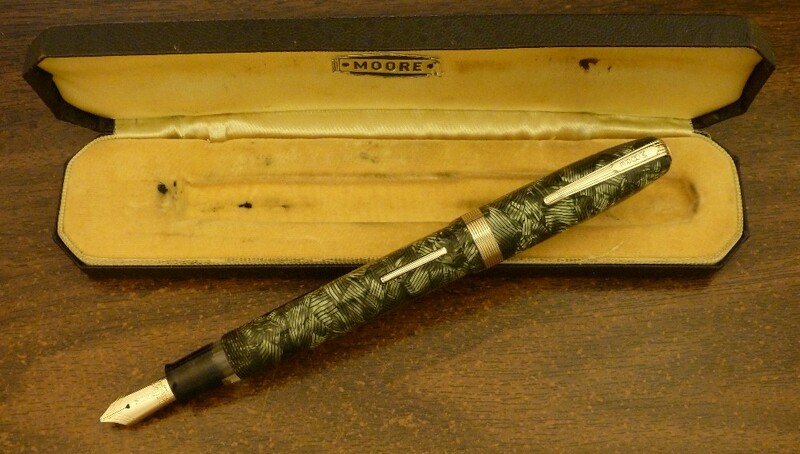 The chased version of this pen, with no fancy trim, was one of my first Moores, and I looked for a long time before I found this one. Excellent condition with near perfect dark hard rubber, minor wear to the chasing. The cap band is perfect, with crisp engraving and initials 'TJW' in the cartouche. 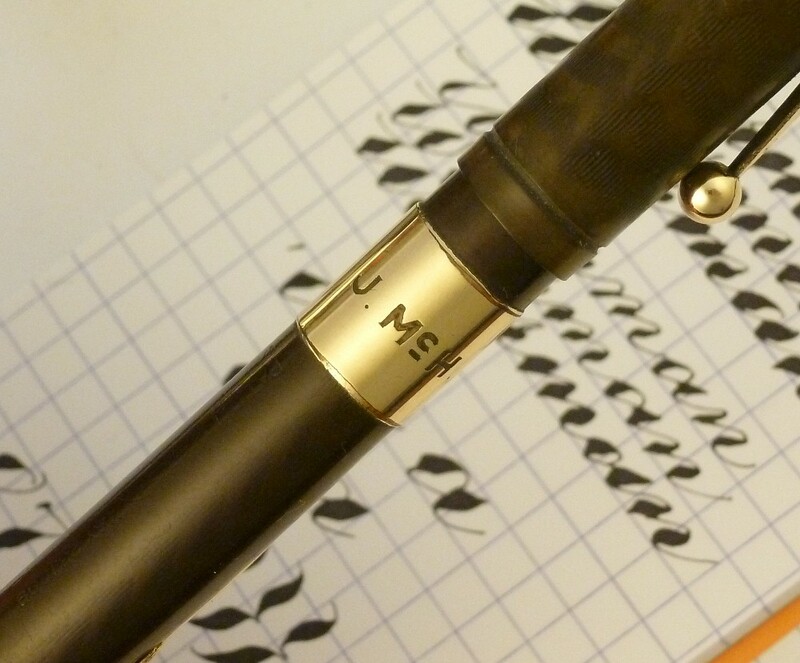 Two typical Moore flaws are present, neither affecting use: the short crack at one corner of the lever slot, and the barely perceptible line coming up from the back of the nib, into the '4'. 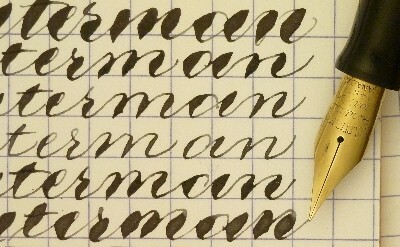 The nib is fine and semiflexible, the typical 'Maniflex'-style. Restored and working with new sac installed. Length just under 5 3/8 inches. Item 9026 $265 plus $10.00 shipping and insurance to USA addresses, $30 for international. Email for invoice. 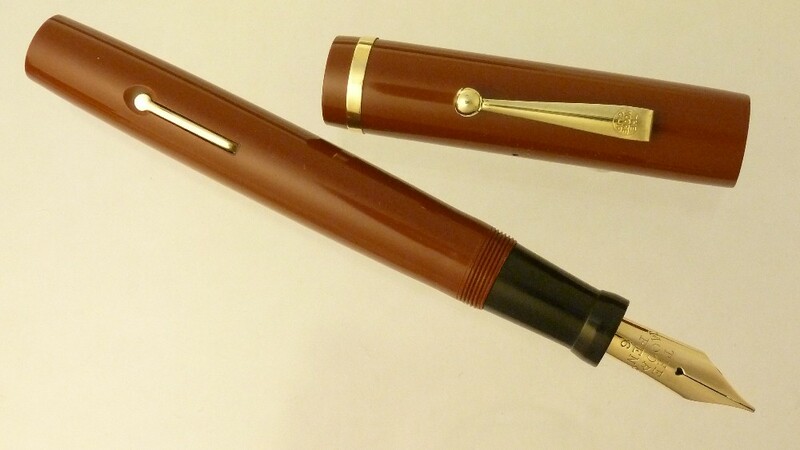 1920s Moore L-96 in its 'Tuscan' -- a distinctive burnt sienna or venetian red -- celluloid with gold filled trim. 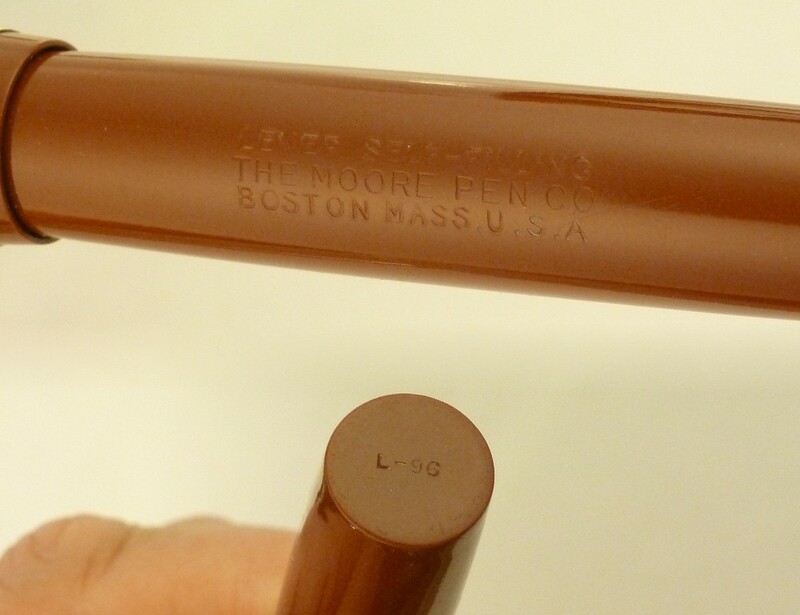 The L-96 was Moore's largest celluloid pen and, in addition to Tuscan, came in black and in blue. 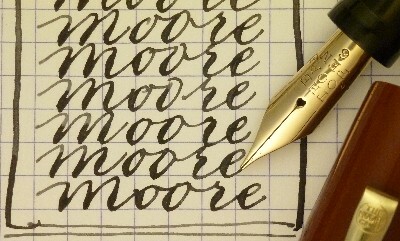 It has Moore's large No. 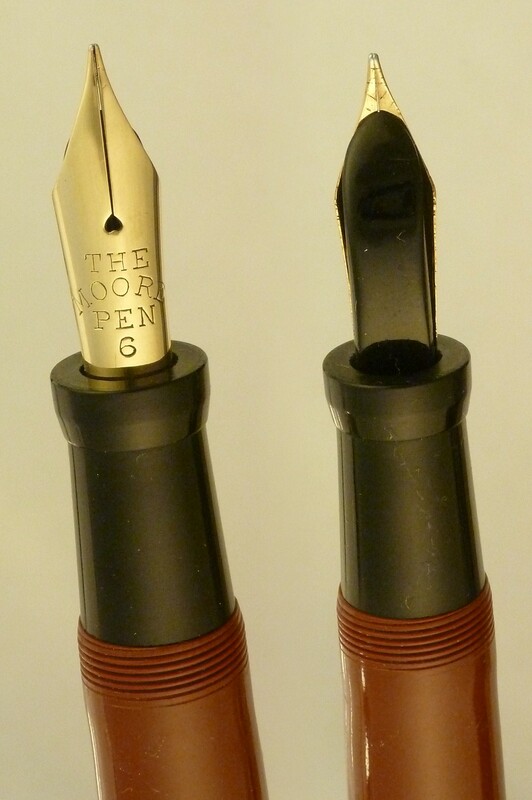 6 nib. 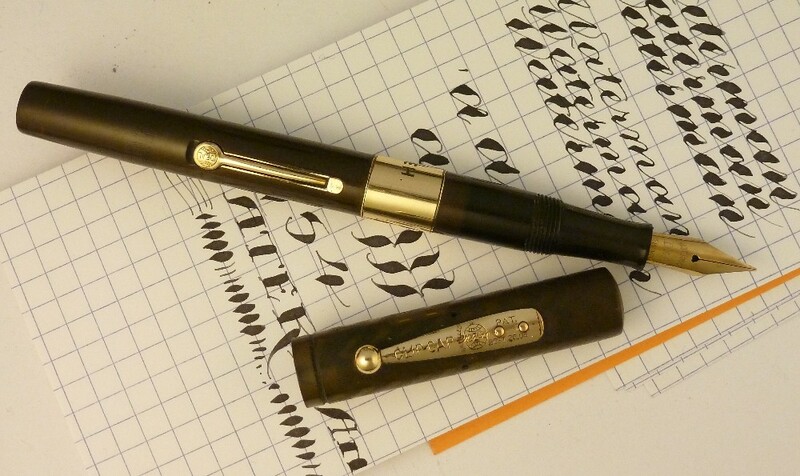 This one I'd call a medium point and it has the pleasant springiness that typifies Moore's maniflex style -- it has enough flexibility to satisfy 1920s users yet is stiff enough to writing through carbon paper. 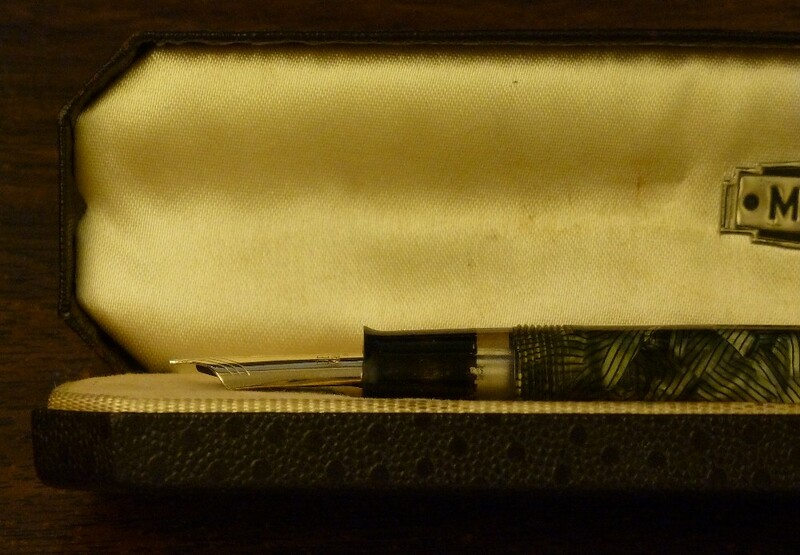 Near mint condition with a few stray nicks and one tiny dot of wear on the clip ball, but note some scratches on the nib, mostly on the inside. Great color, excellent imprints. Restored and working with a new sac installed. Length 5 1/2 inches. 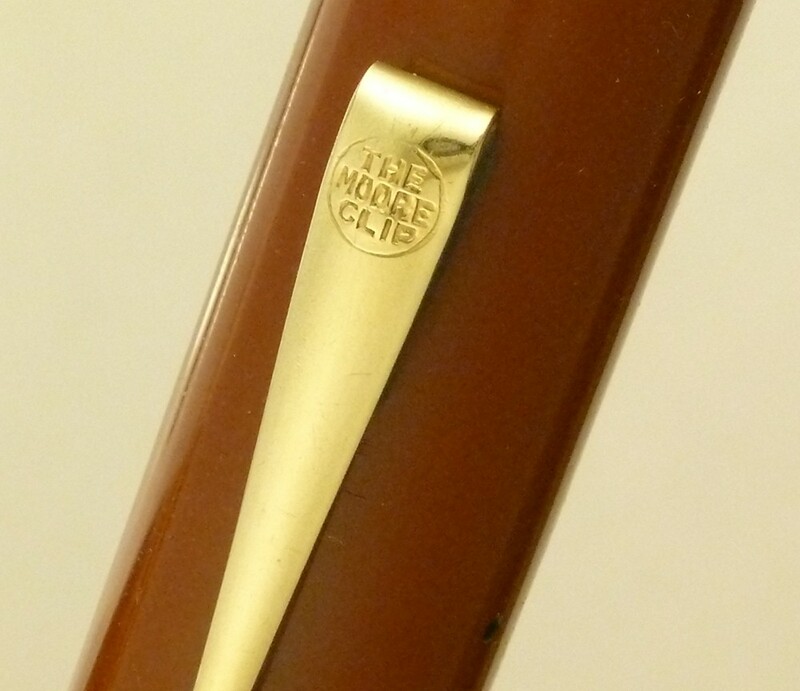 Moore's answer to the Vacumatic had the styling but stuck to the tried and true lever filler. 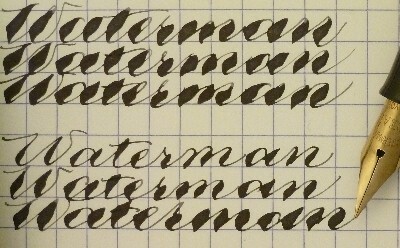 There were two or three styles, and most are found in the a medium size with a No. 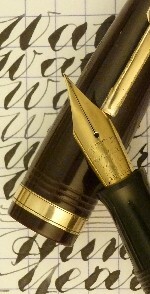 4 nib. But this is the big one, the No. 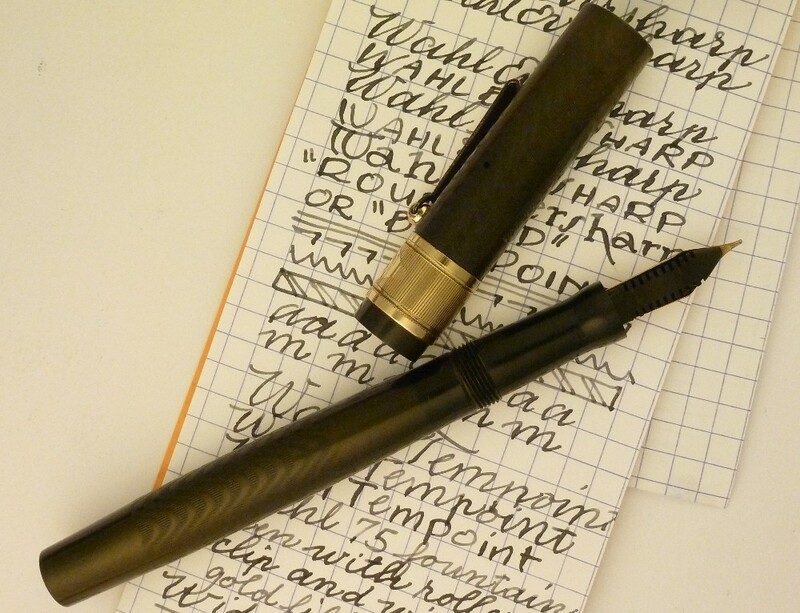 6 model, wide and beefy with a Deluxe Maniflex nib that's the same size as the No. 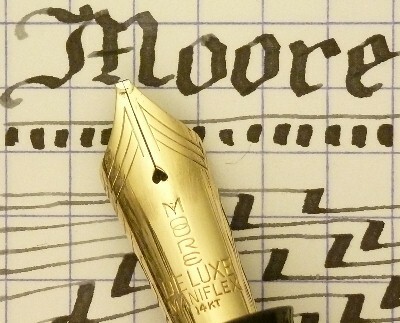 6 nibs found in Moore's 1920s L-96. 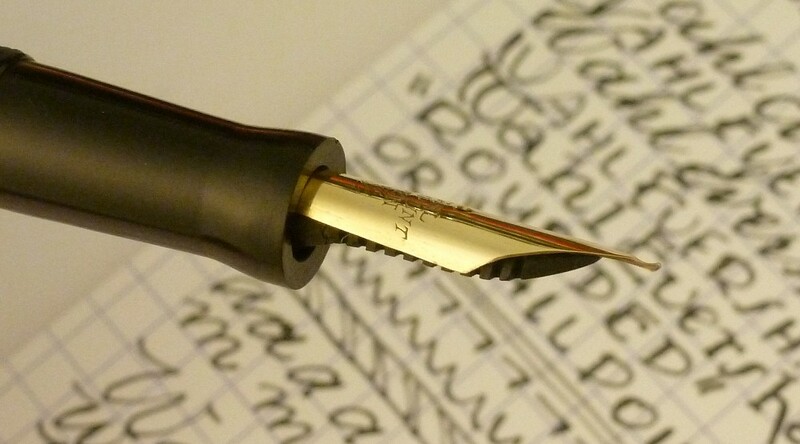 The nib has been professionally retipped by Greg Minuskin with a 1.2mm wide italic point. 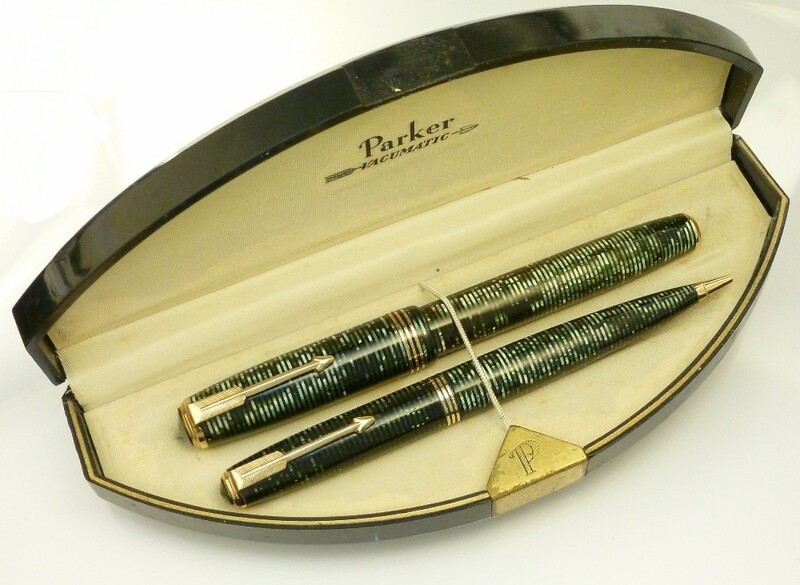 The box is wild -- one of the few pen boxed specially designed to display the pen with the cap posted and the nib exposed. Near mint condition with virtually no wear. Some black paint missing from the clear section. Some wear and staining on box. Restored and working with a new sac installed. 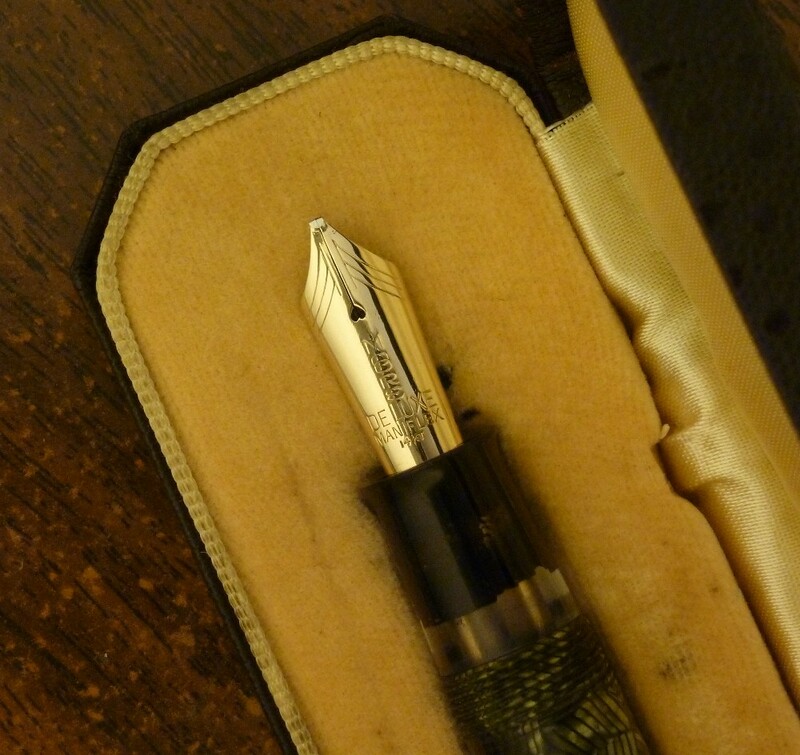 Length of pen, closed, with cap screwed on, is about five inches. Thomas de la Rue Onoto No. 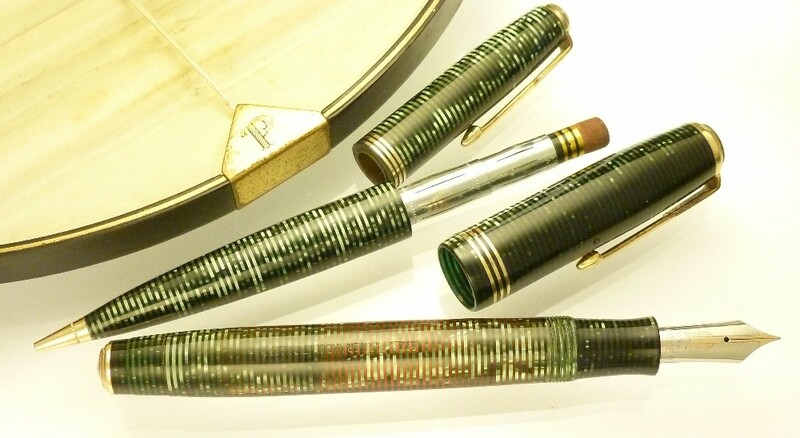 5 size pen in green marble celluloid and gold filled trim. Probably 1930s. 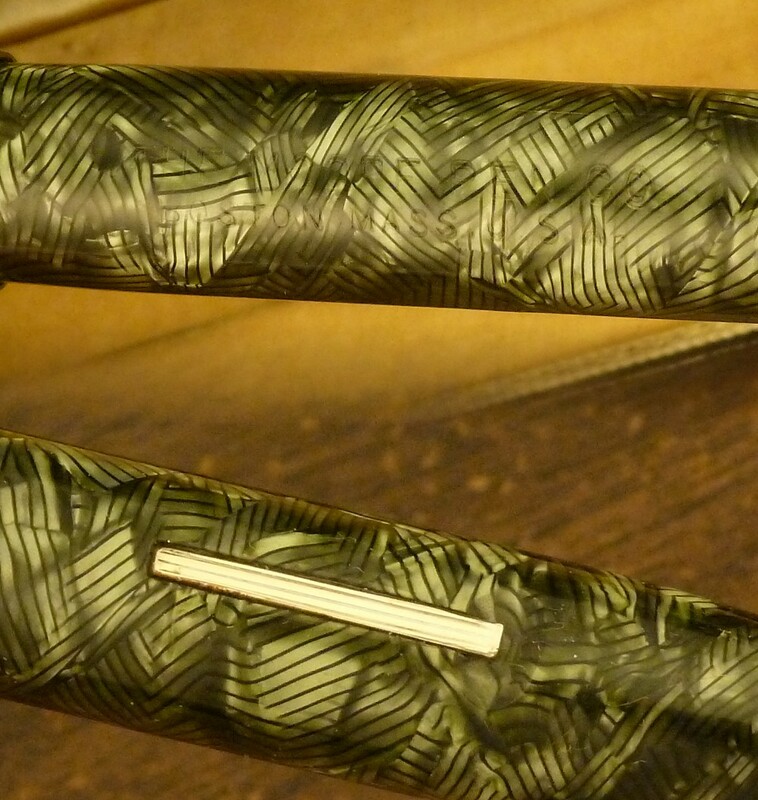 This is one of those extra long Onotos with the very long section, which makes it very comfortable to hold and use. In the large No. 5 size, these are getting hard to find. 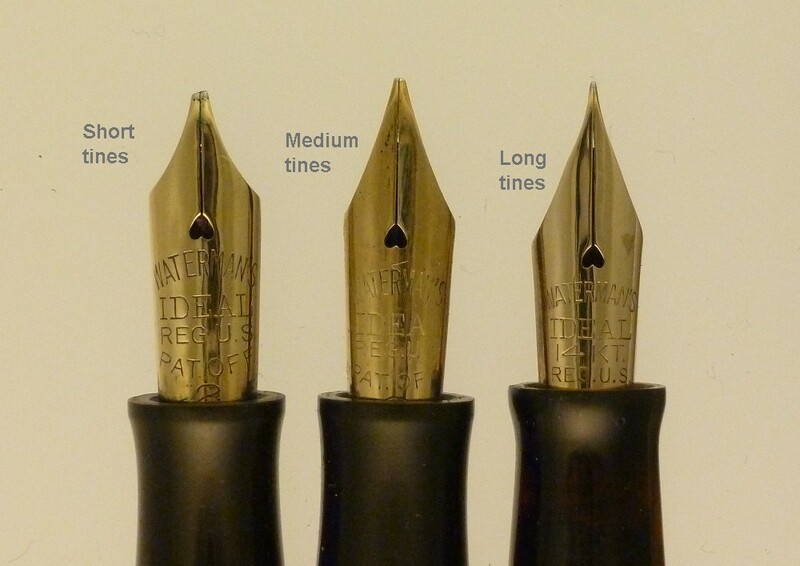 The nib is flexible but not wide, the tines spreading readily to a moderate width. 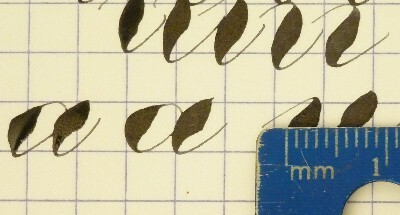 There's a slight italic effect -- with no pressure, the downstrokes are wide, the lateral strokes narrow. 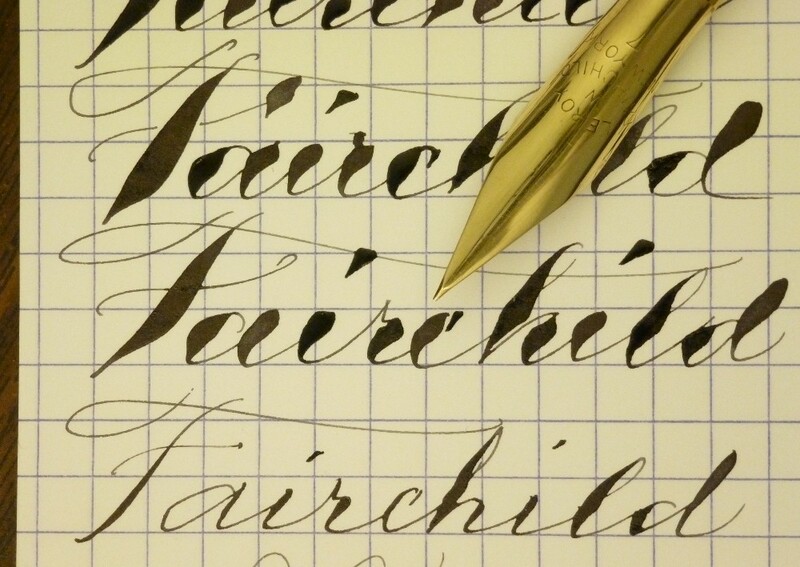 The overall feeling is that of writing with a feather, a long thin effortless device. 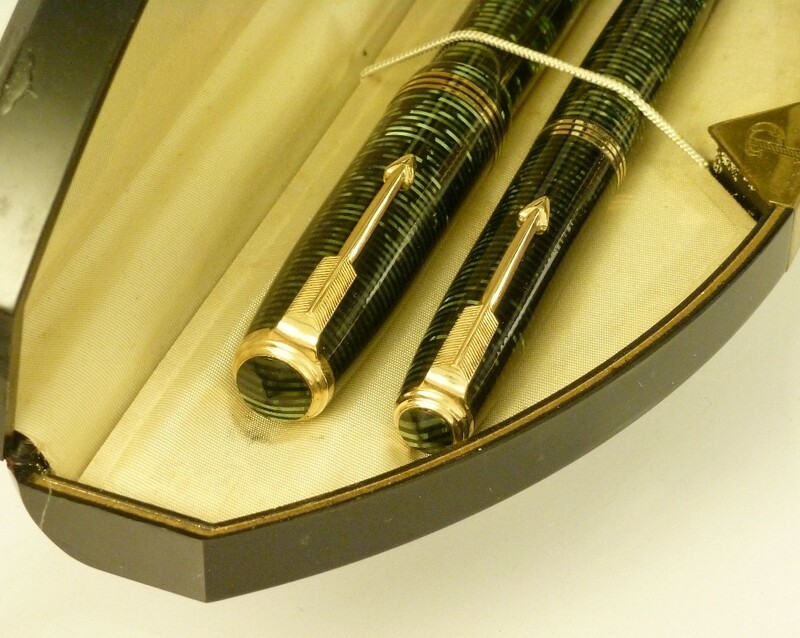 Excellent condition with perfect bright color to the celluloid, nice dark color to the black hard rubber section and ends, excellent barrel imprint, minor trim wear. 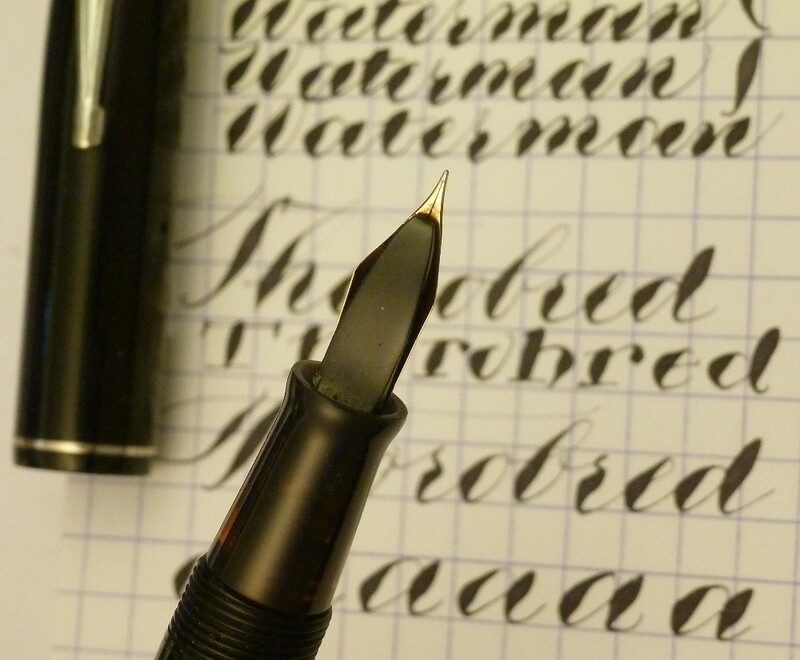 The nib is cosmetically not quite perfect, with a slight wave toward the tip and rough edges on the sides (has been taken into account in pricing). 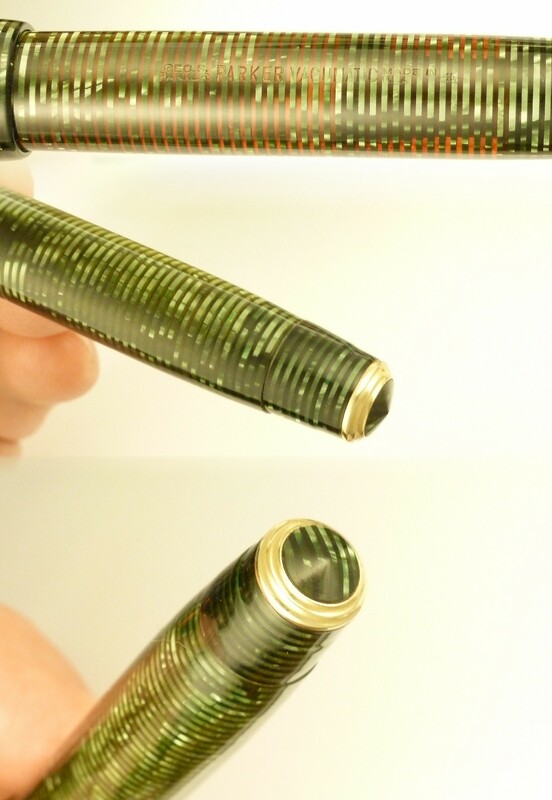 This pen uses Onoto's piston filling system, similar to a Sheaffer vacuum filler but with the blind cap operating as an ink shutoff (so must be unscrewed for prolonged writing). 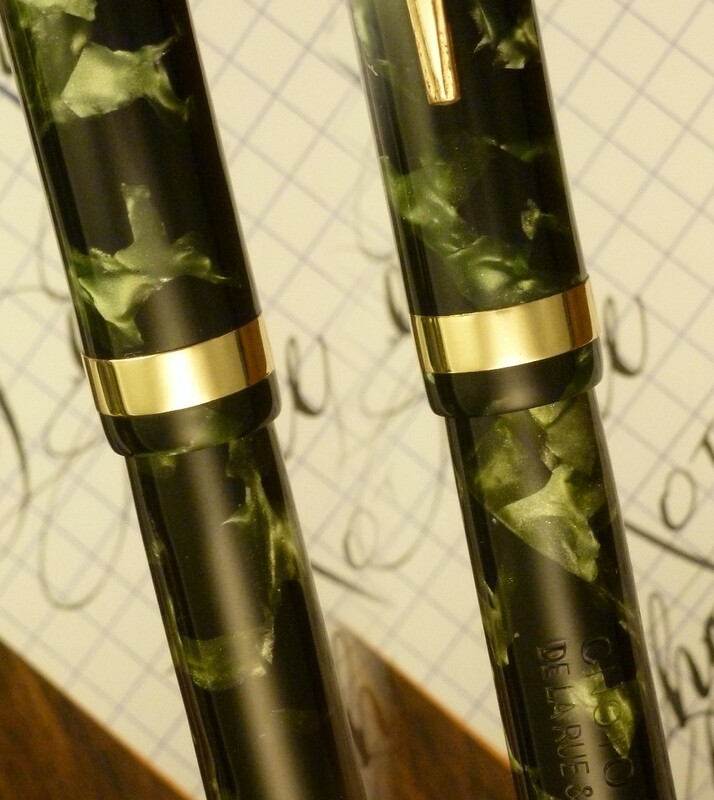 Restored by Aaron Svabik of Pentiques with new seals. Length about 5 1/2 inches. 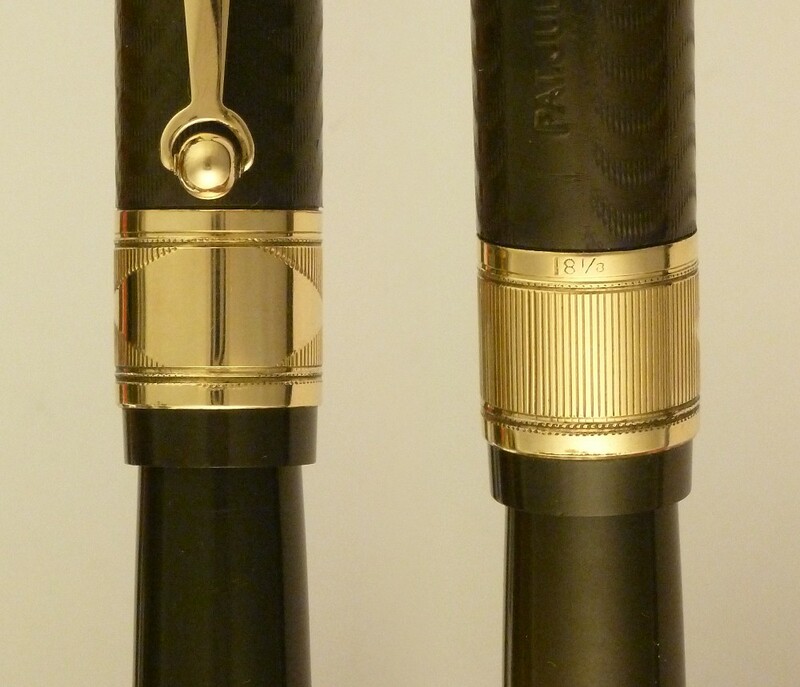 Parker Duofold Senior in black Permanite celluloid with gold filled trim. 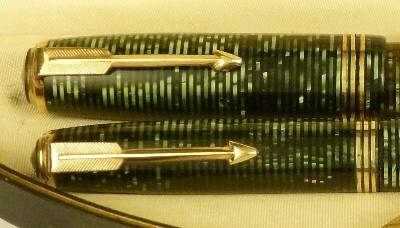 An early-ish streamlined pen with correct early spear feed, probably 1930-'32. 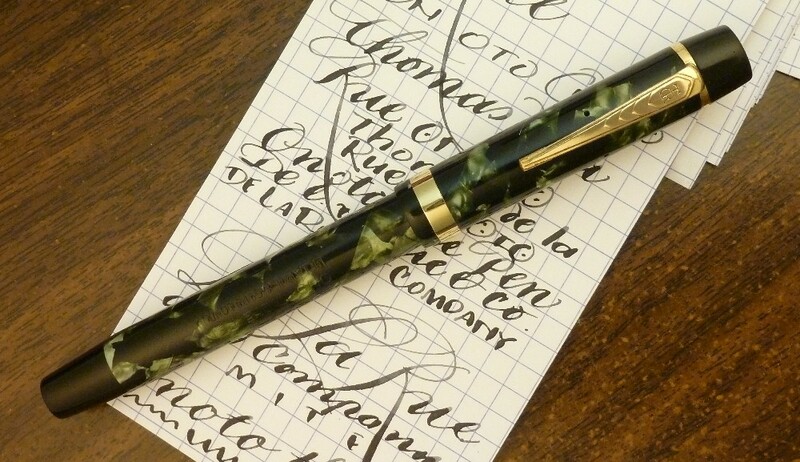 Hard-to-find fine flexible nib. 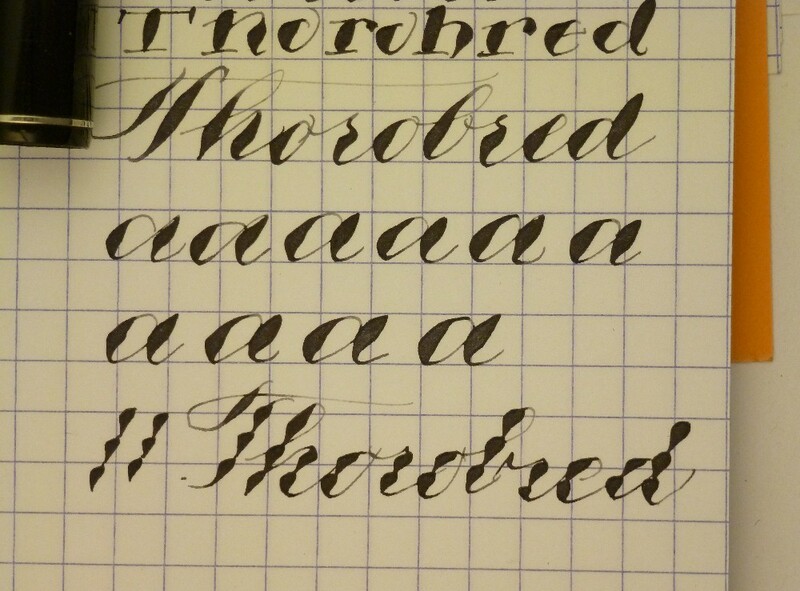 It's not terribly soft, but with pressure you can get good copperplate effects -- see the writing samples. 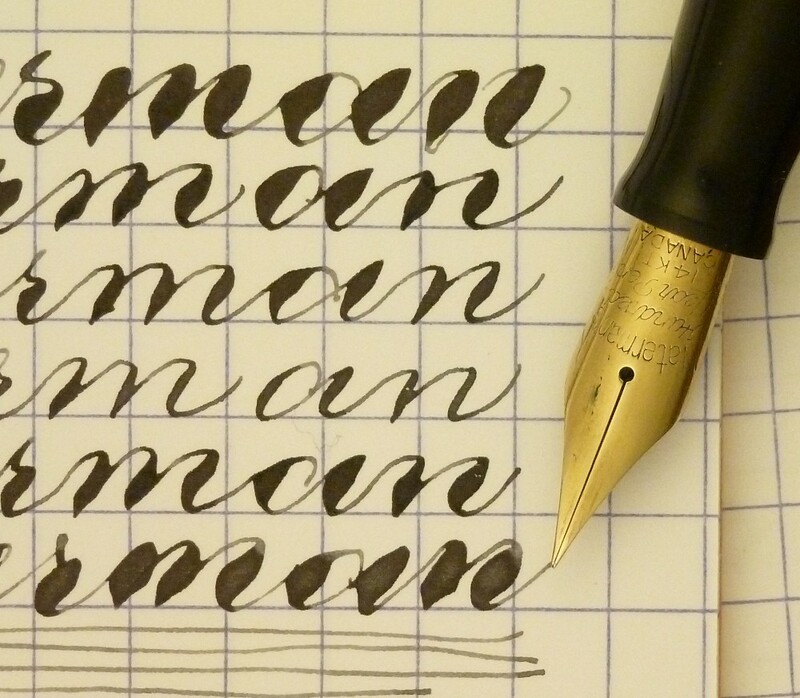 For everyday writing it gives a pleasant springiness, a lot like the typical Moore Maniflex or a Waterman No. 7 Brown or Red point. 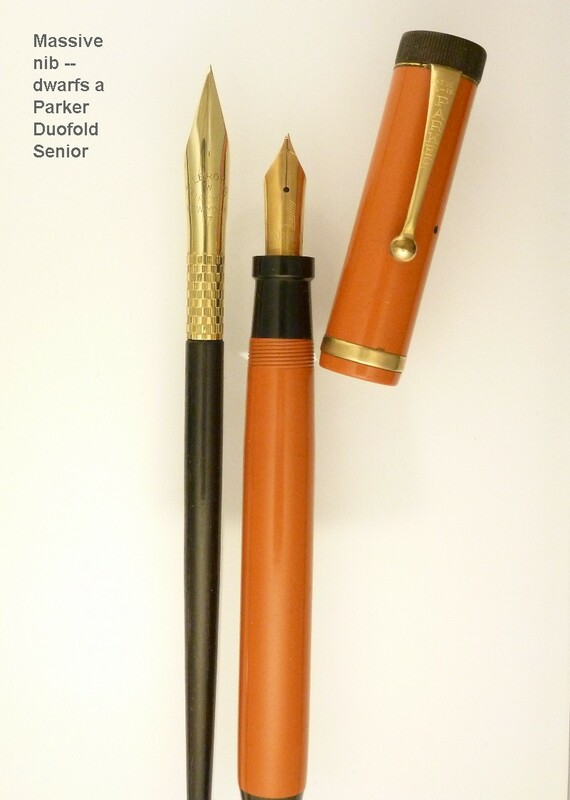 It's quite a thing to get this from a Duofold Senior; most nibs are pretty nail-like. Very good condition with no chips or cracks, some trim wear, nice glossy plastic, nice dark hard rubber crown and blind cap, okay imprint. 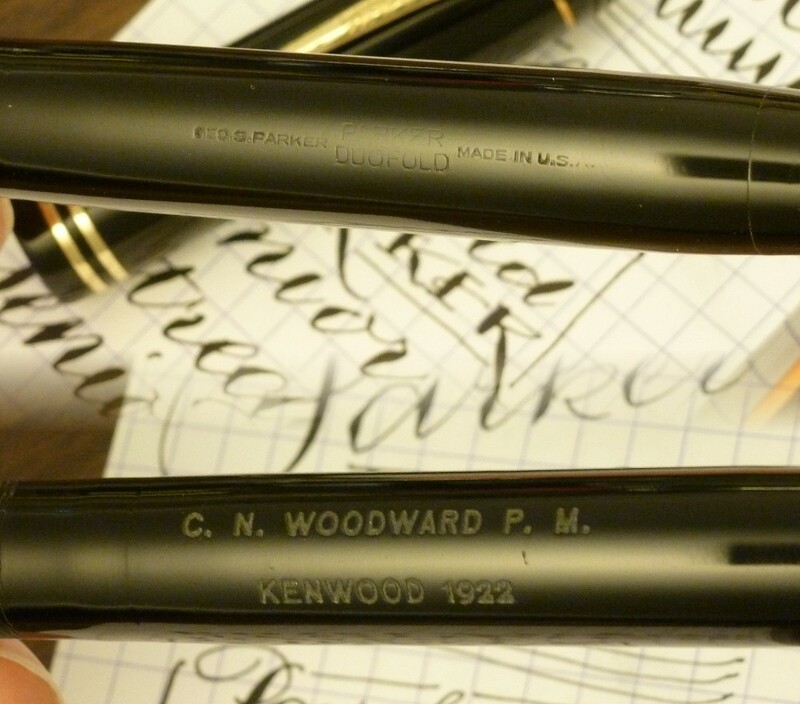 Charming engraving 'C.N.Woodward P.M. / Kenwood 1922.' 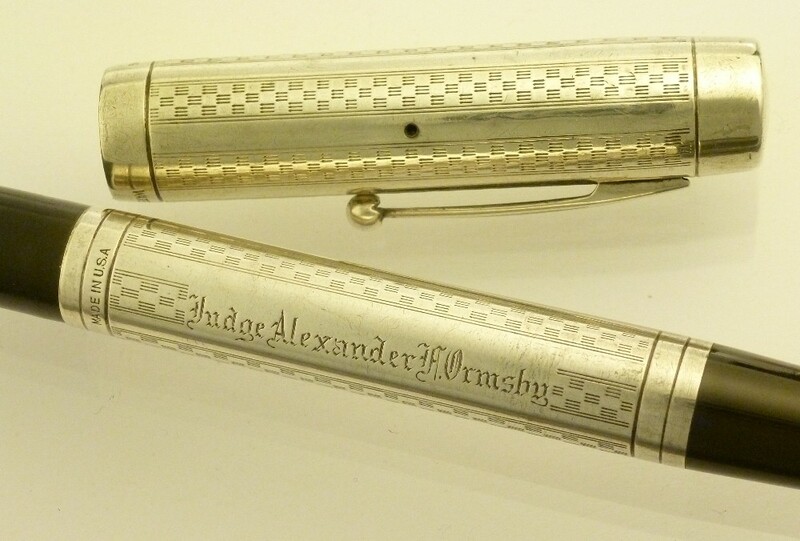 My guess is that the pen was given on the 10th anniversary of the 1922 date. Restored and working with a new sac installed. Length just over 5 1/8 inches. 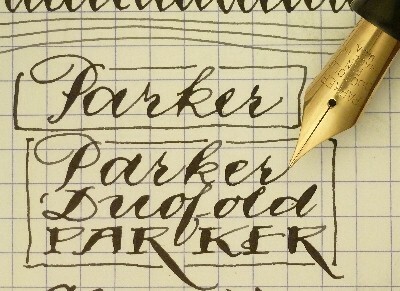 First generation Parker Vacumatic in the oversized model. Emerald green laminate with gold filled trim. 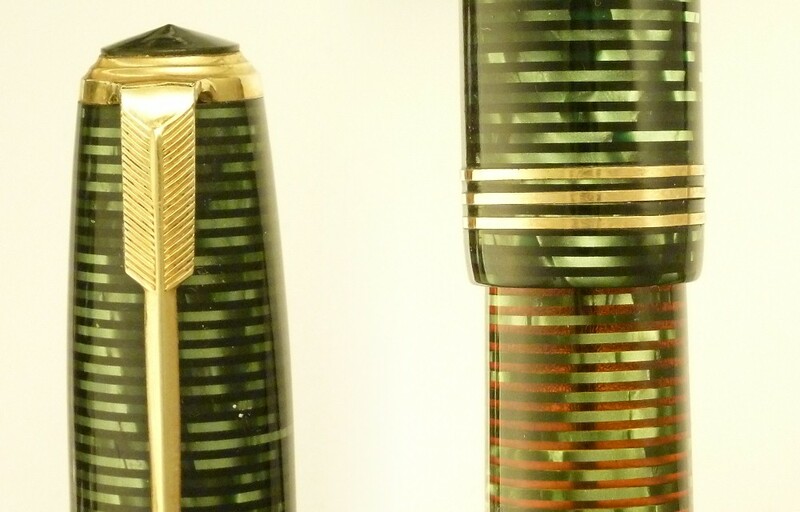 Correct striped top and bottom jewels, striped section. 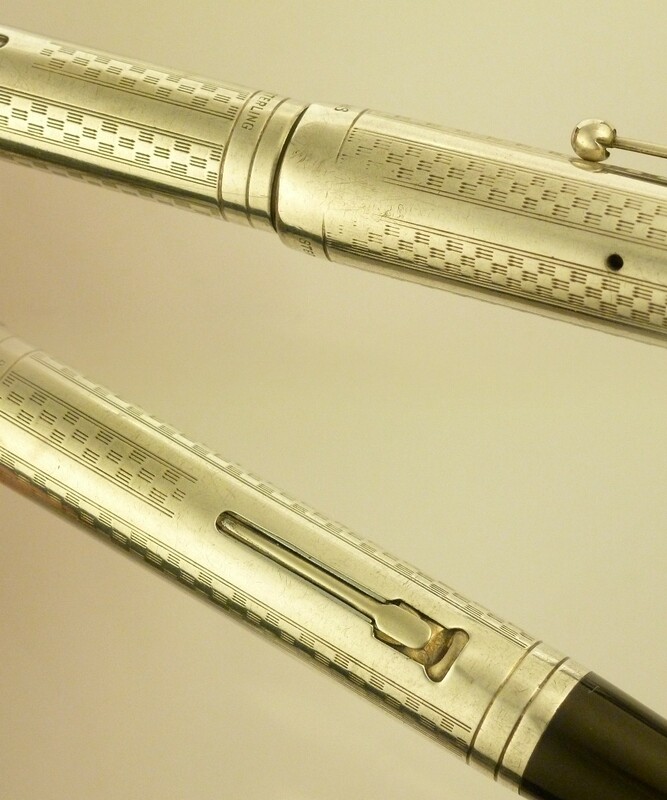 Near mint with perfect trim, clear imprints, excellent platinum plating on the two tone nib. Excellent barrel transparency. 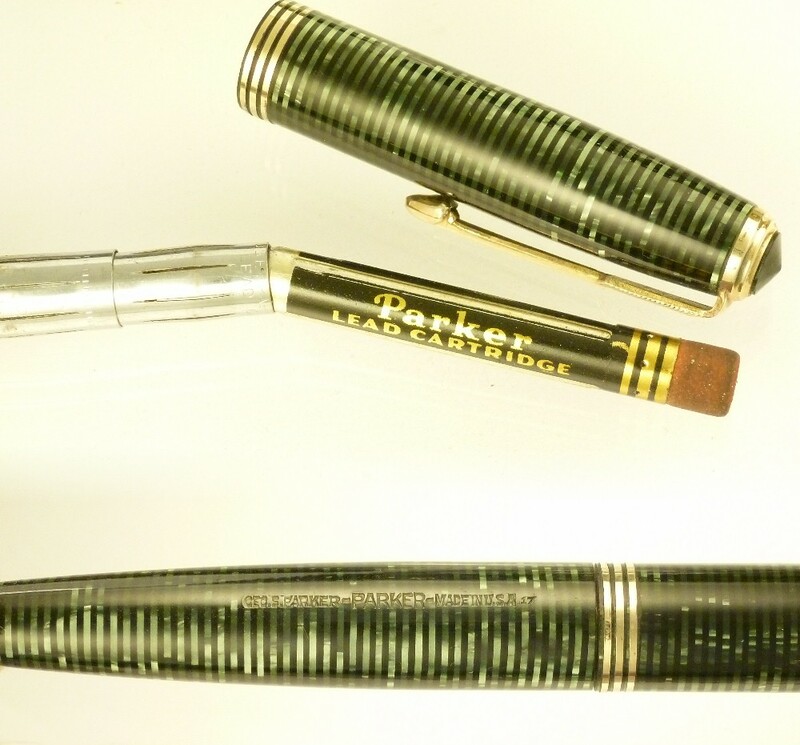 Pencil contains correct Parker lead cartridge with unused eraser. 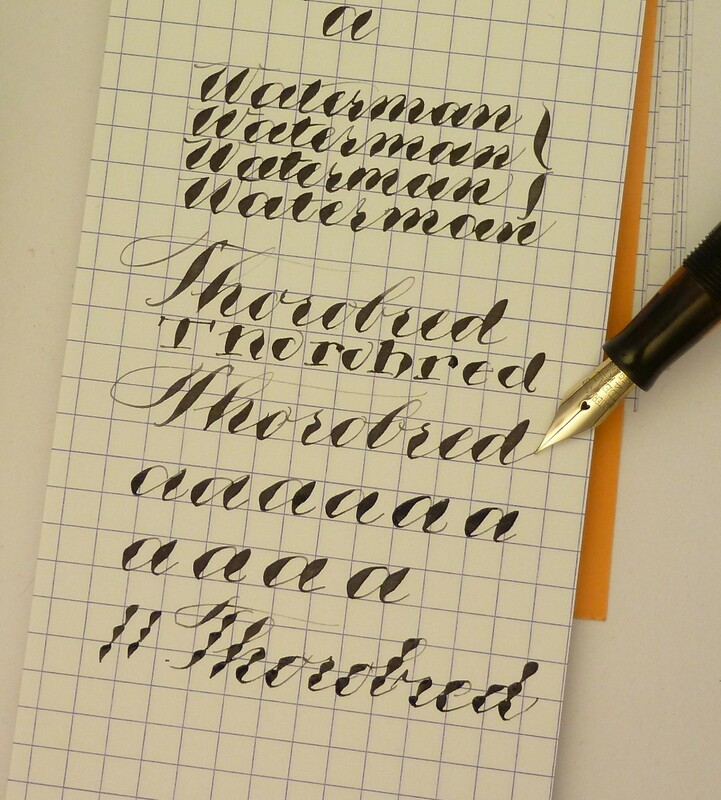 One of the best examples of this pen I've had. 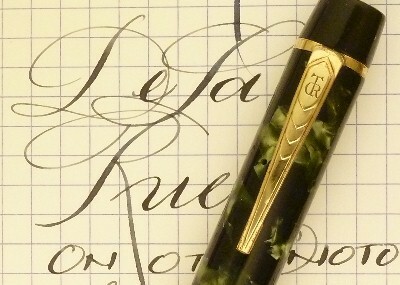 Note the top of the pen: the trim edges are crisp, the top jewel sharp. 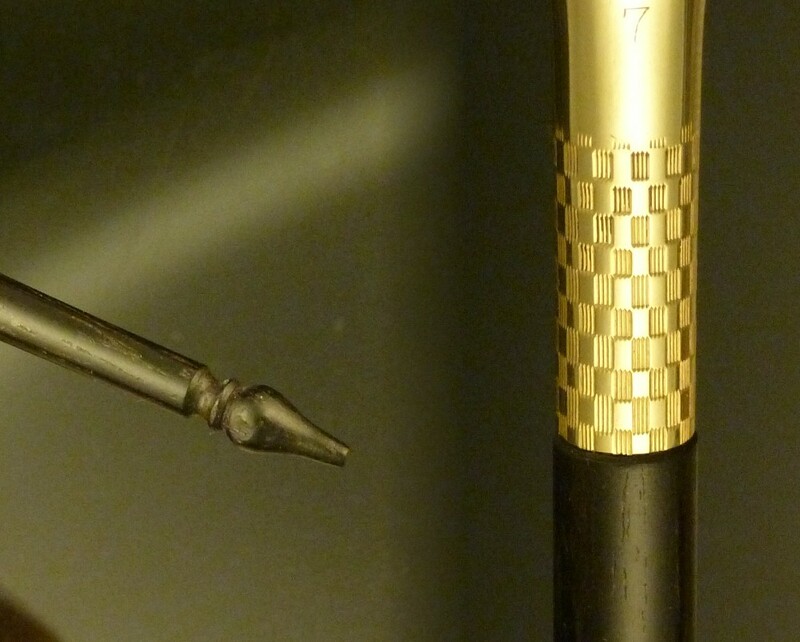 The big bulbous pencil is actually probably more rare than the pen, and is certainly as impressive. 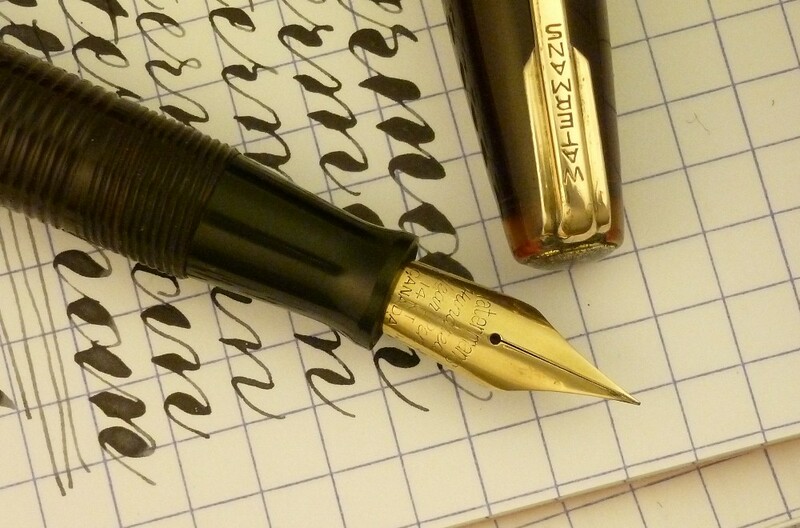 The only flaws I find are on the pen's blind cap: there are a few minor nicks, some shrinkage around the metal threading, and after restoration the surface is not quite perfectly flush with the barrel. The box is excellent but with the typical missing top decorative clasp. 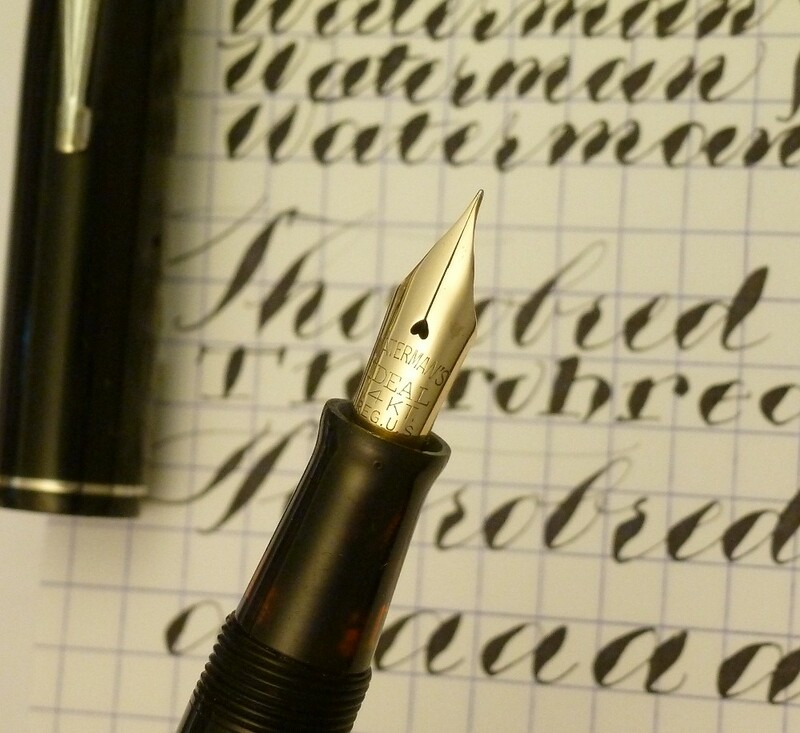 The nib is fine and firm. Lockdown Vac filler is restored and working with a new diaphragm installed. The pencil is also working. Item 1107 $950 plus $10 shipping and insurance to USA addresses, $30 for International. Email for invoice. Item 9531 $115 plus $10.00 shipping and insurance to USA addresses, $30 for international. Email for invoice. Item 9532 $165 plus $10.00 shipping and insurance to USA addresses, $30 for international. Email for invoice. Item 9534 $135 plus $10.00 shipping and insurance to USA addresses, $30 for international. Email for invoice. 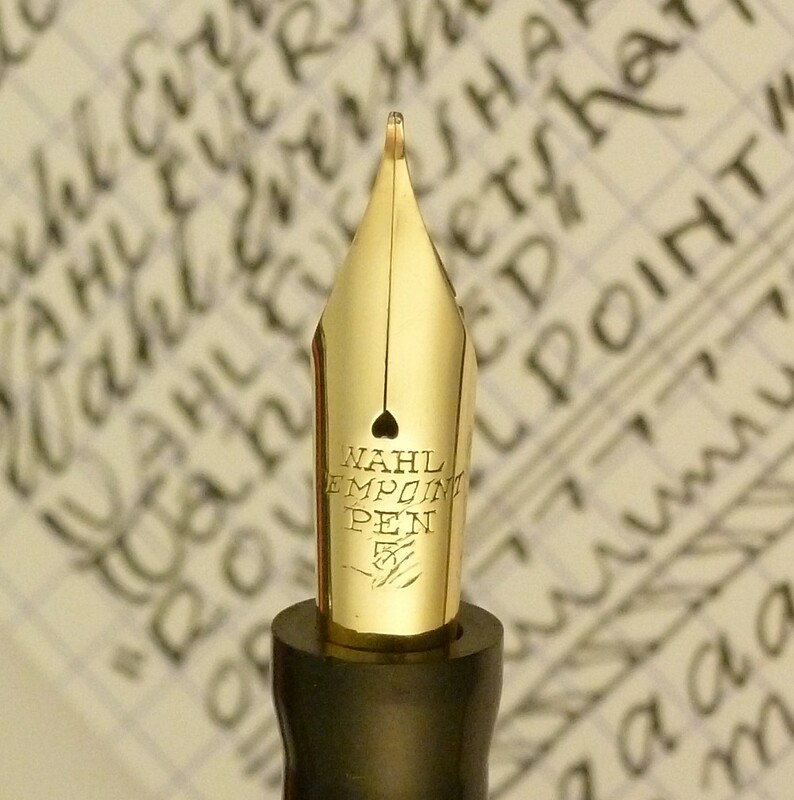 1920s Wahl, hard to find large size, in black chased hard rubber. 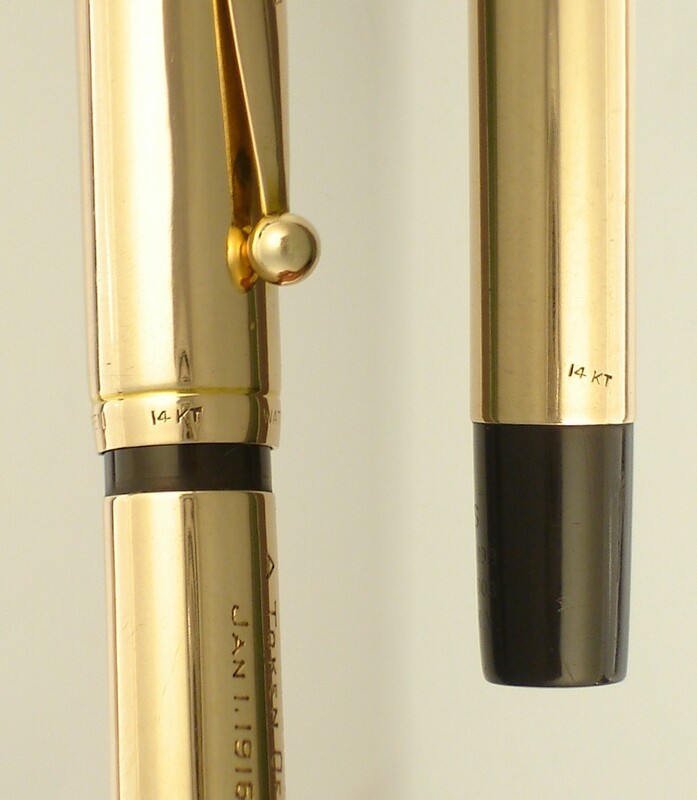 Early roller clip with '14k 1/10' mark. 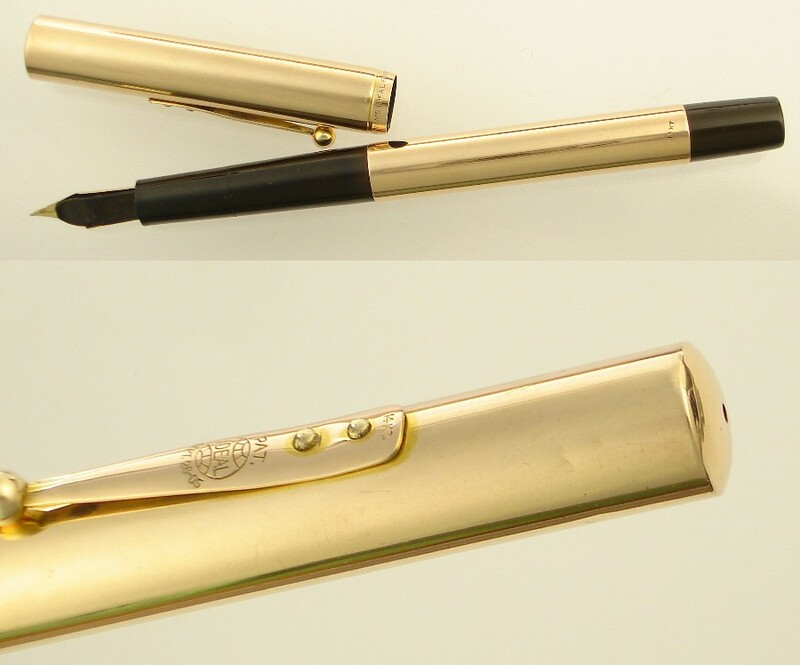 Unusual wide cap band with deep, sharp vertical line engraving and unengraved diamond-shaped cartouche. 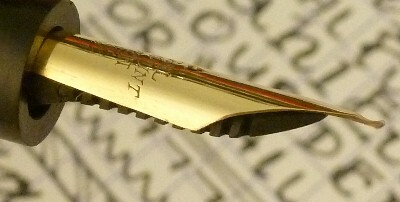 The band is marked '18 1/8', indicating extra thick ('1/8') 18-carat gold fill. 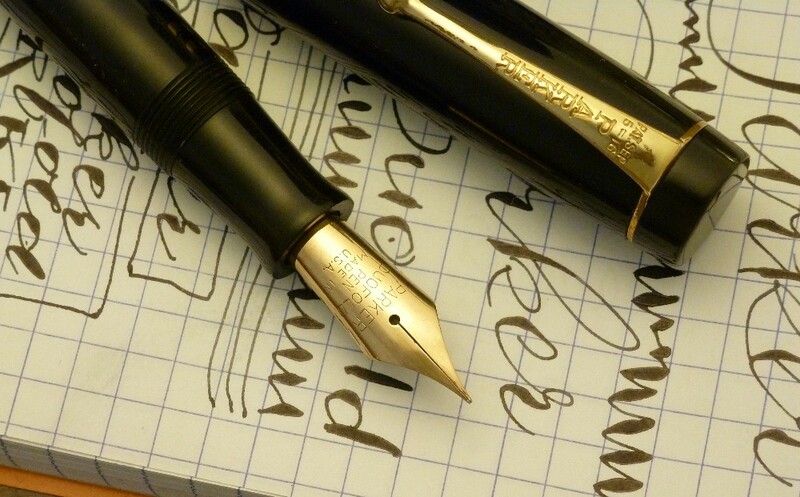 The nib is 'rounded' or 'ballpoint' -- like Waterman's yellow color-coded nib -- a notched, upturned tip designed to make for smooth writing at all angles. 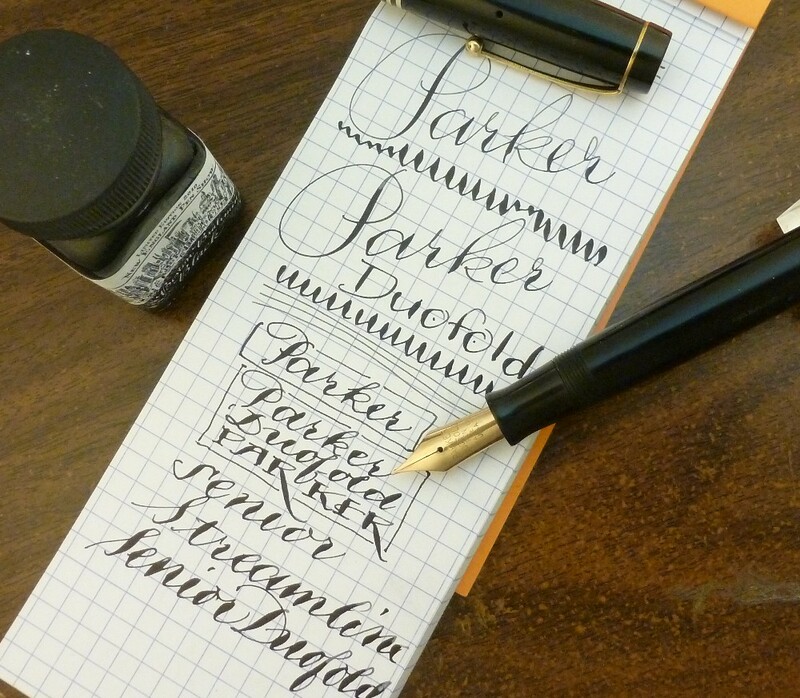 It will avoid catching on the paper even when the pen is pushed, rather than pulled. So among the target audience would be lefthanded 'hook' writers. 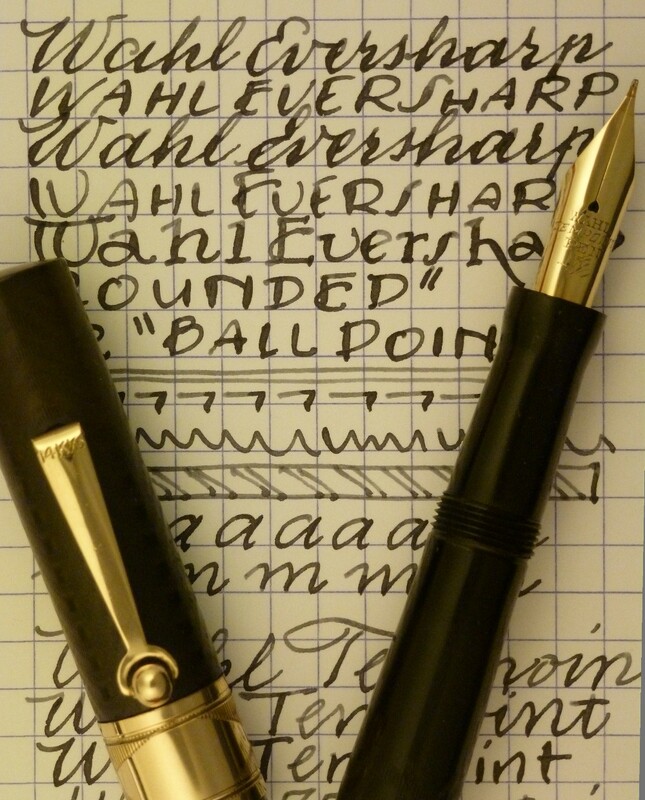 I'd call this nib a medium point. It's slightly flexible. 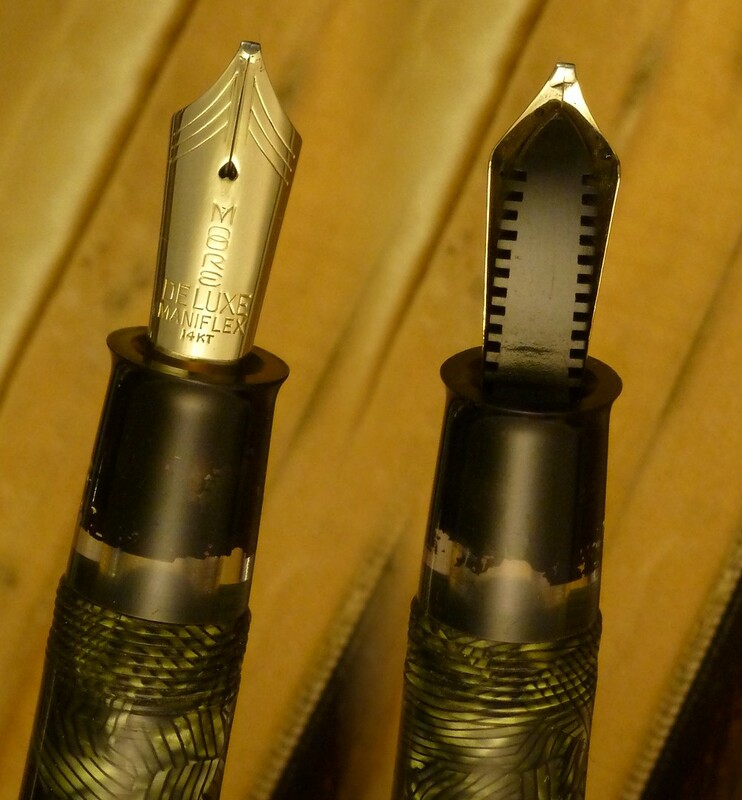 Very good condition with some wear and fading to the hard rubber, a tiny amount of trim wear, some scratches on the nib. Restored and working with a new sac installed. Length about 5 1/8 inches. 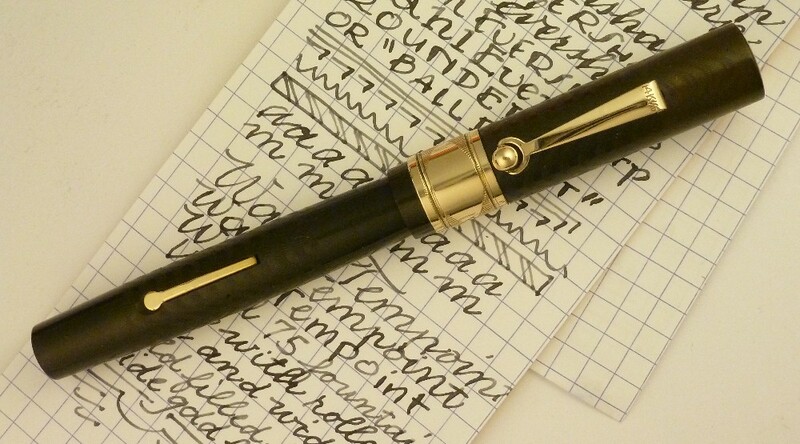 Waterman 514 overlay fountain pen in solid 14k gold over hard rubber, circa 1916. Elegant smooth finish. 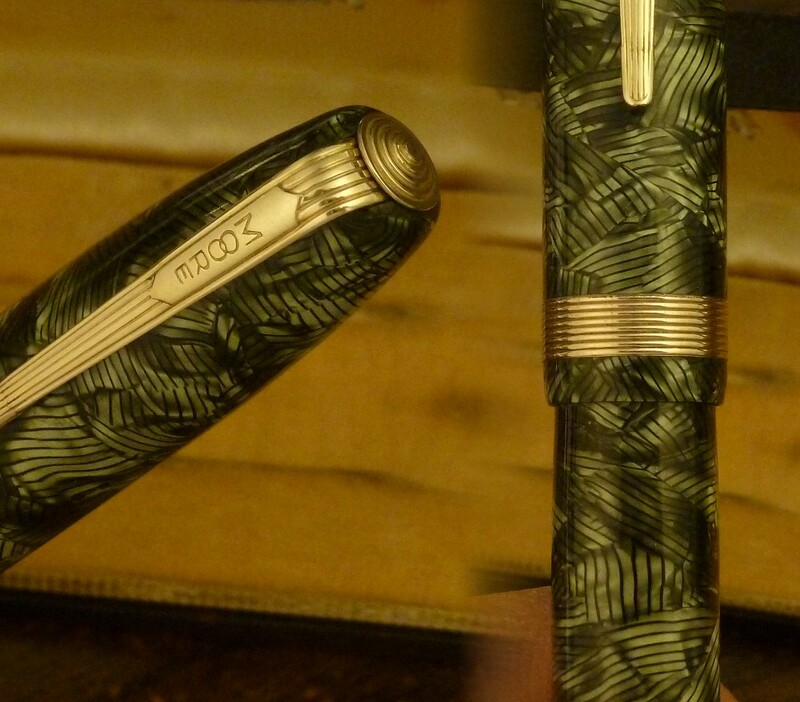 Marked '14k' on the cap, barrel, and pocket clip. The No. 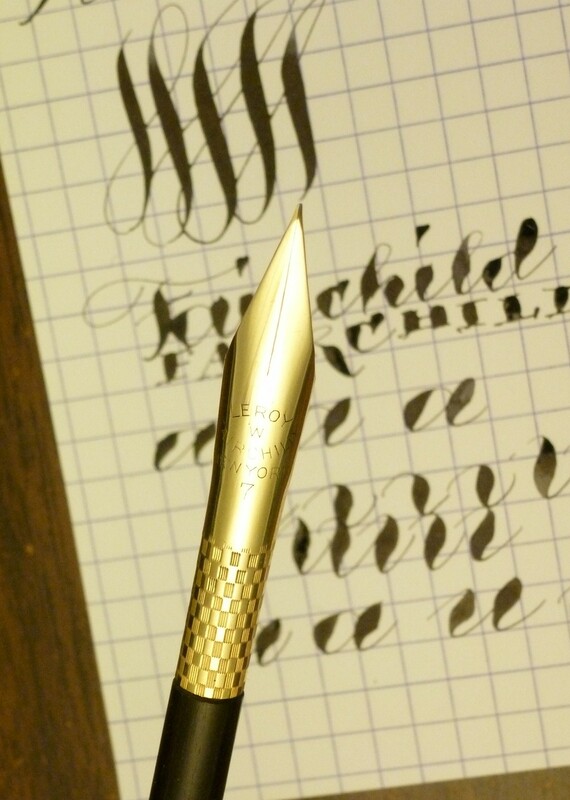 4 nib, also 14k, is fine and somewhat flexible. Very good condition with a few minor indentations in the gold, legible imprints, minor fading to the hard rubber, and some scratches around the bottom imprint. Owned by Edward Swann, a New York lawyer and politician who served in the U.S. Congress (1902-'03), as a judge of the Court of General Sessions (1908-1915), and as the New York County District Attorney (1916-1921). As Manhattan D.A. his successors include Thomas E. Dewey, Frank Hogan and Robert Morgenthau. The office is currently held by Cyrus R. Vance, Jr. Swann was a Tammany Democrat, and reformers sought several times to have him removed from office for misconduct. See his Wikipedia entry here. The presentation engraving reads 'Hon. Edward Swann / A Token of Esteem and Affection. / Jan. 1, 1916. The Interpreters.' Swann was just leaving the Court of General Sessions to take up his position as district attorney on January 1, 1916, so I'm assuming that 'The Interpreters' was a group of judges. Swann died in Florida in 1945. 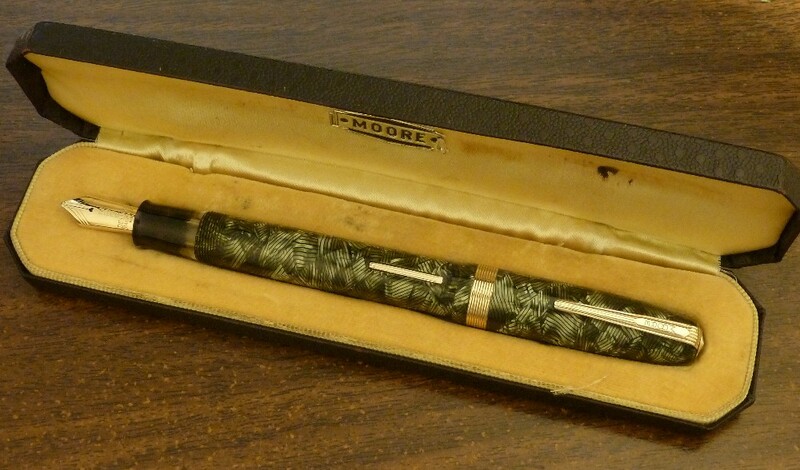 I bought this pen recently as part a Florida collection. 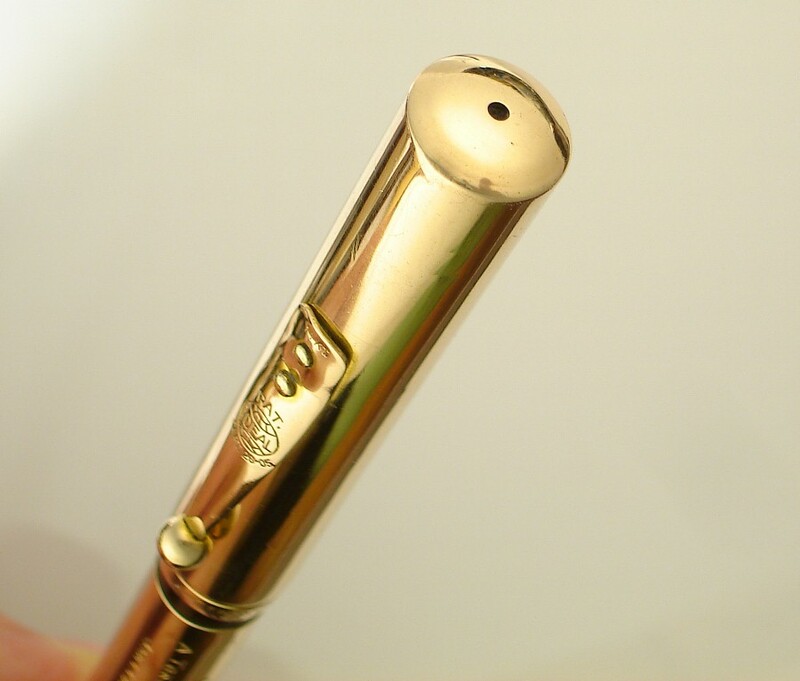 The pen is an eyedrop filler; the section unscrews as it should and the pen functions well. 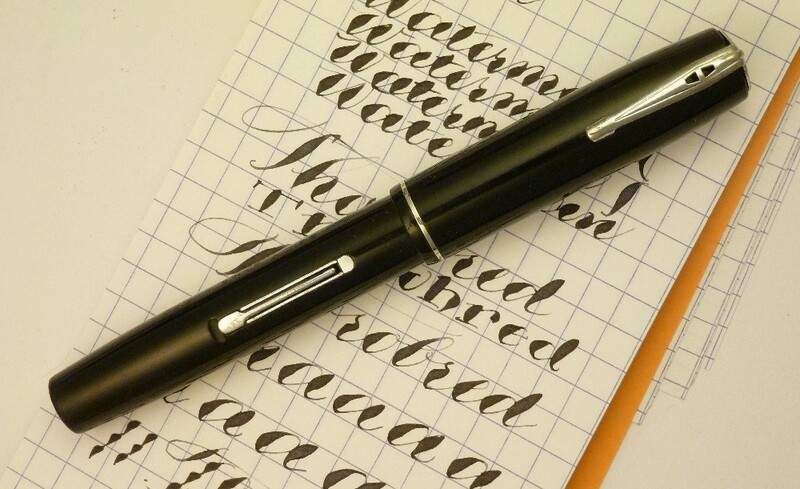 The nib is fine and somewhat flexible -- see the writing samples below. 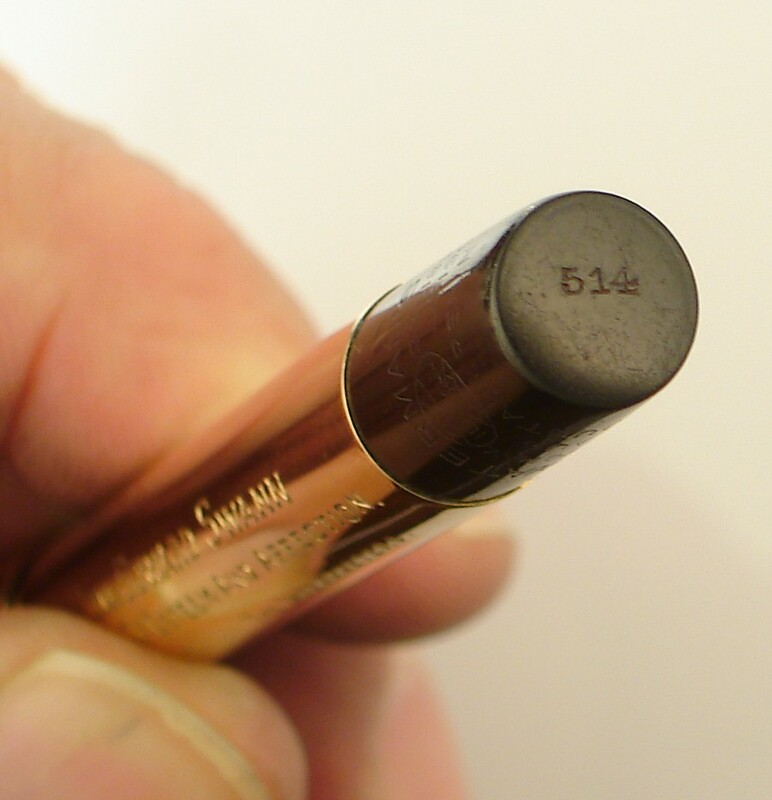 Length is about 5 3/16 inches (132mm). Item 1140 $1100 plus $10 shipping and insurance to USA addresses, $30 for International. Email for invoice. 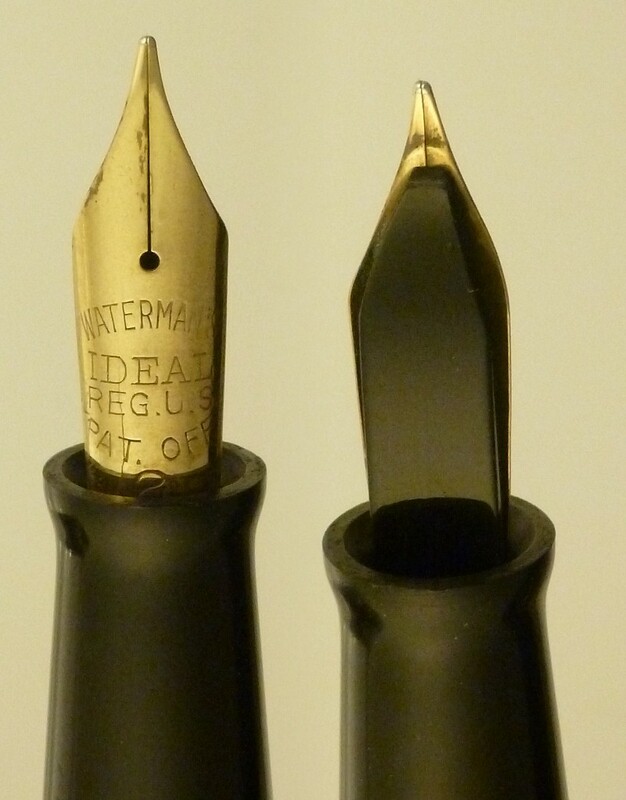 1920s Waterman in black chased hard rubber with gold filled trim and a wide barrel band. 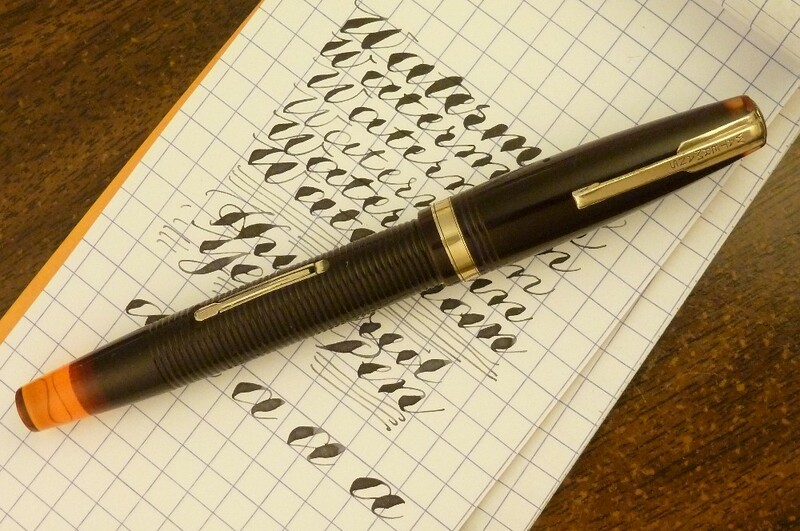 Nice large number-4-size nib. 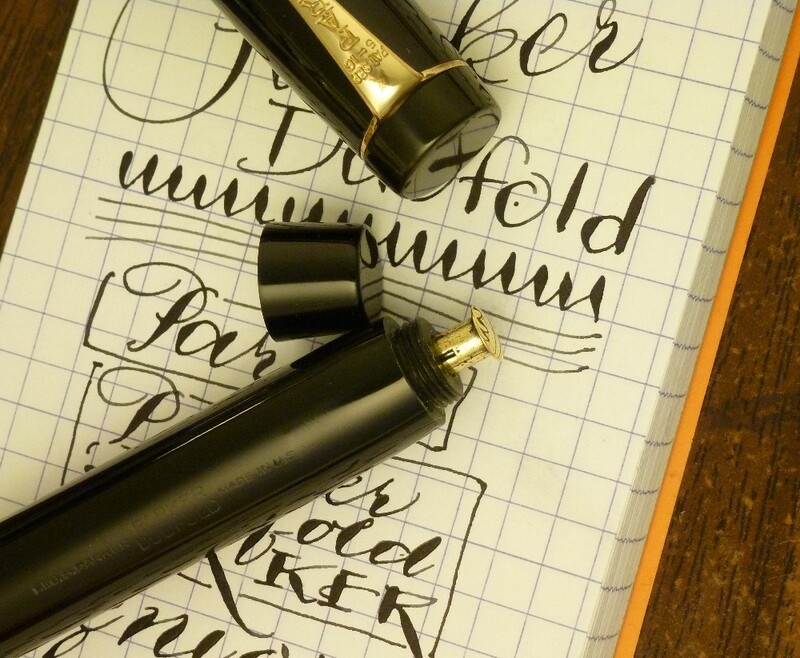 The nib is extremely flexible, opening quite wide with pressure for extremely wide downstrokes. It takes a little pressure at first, and then the tines open readily. They snap back in place quickly. Not a super-soft wet-noodle experience exactly, since there's that little bit of resistance at first before the tines jet apart. These long tines may be delicate, so I advise avoiding constant repeated full-pressure downstrokes. Good condition with no chips or cracks, typical wear and fading to the hard rubber, and noticeable wear showing to the gold filled trim. The hard rubber has faded to an olive brown. Classy Scottish initials 'J. McH' on barrel band. Restored and working with a new sac installed. Length about 5 3/8 inches. 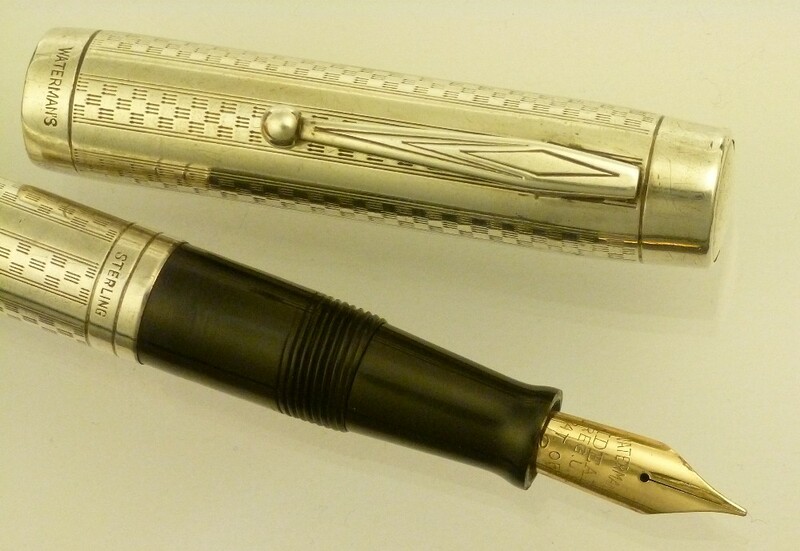 Waterman short stubby pen, Thorobred model, in black celluloid with chrome trim. Successor, basically, to the 52v. 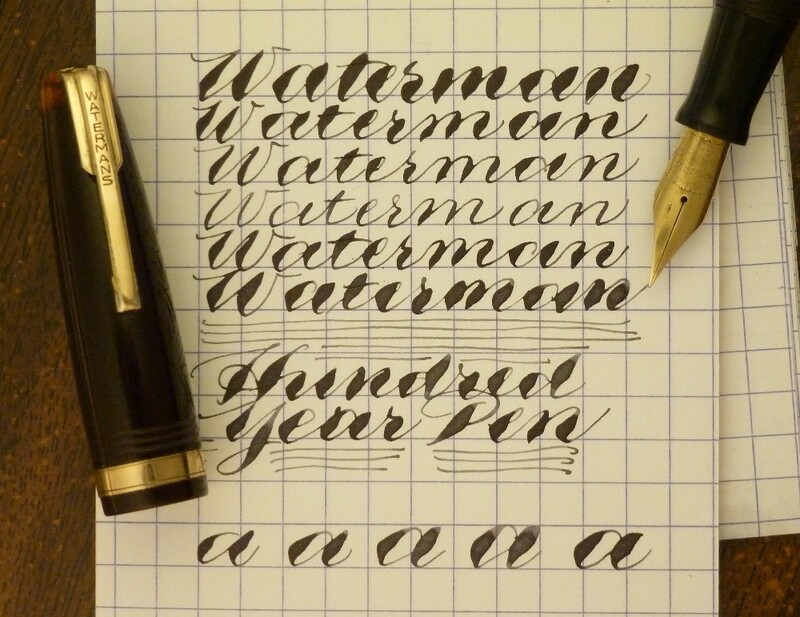 The Waterman No. 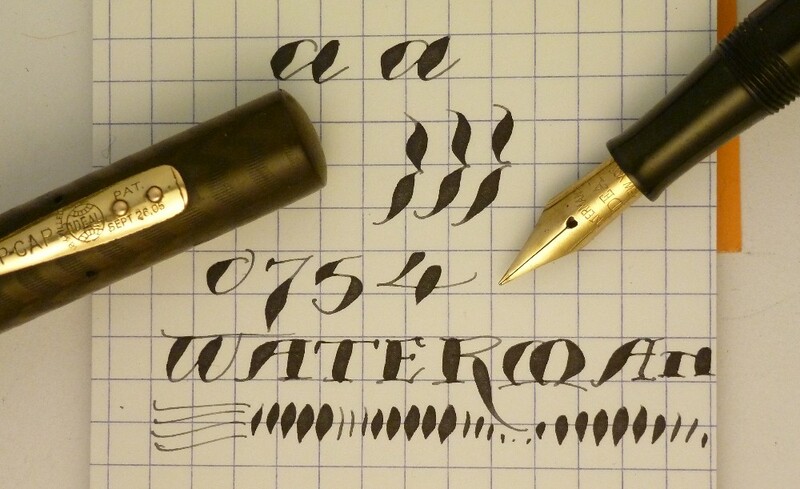 2 nib has those great-looking extra long tines that characterize many flexible Waterman nibs, like the No. 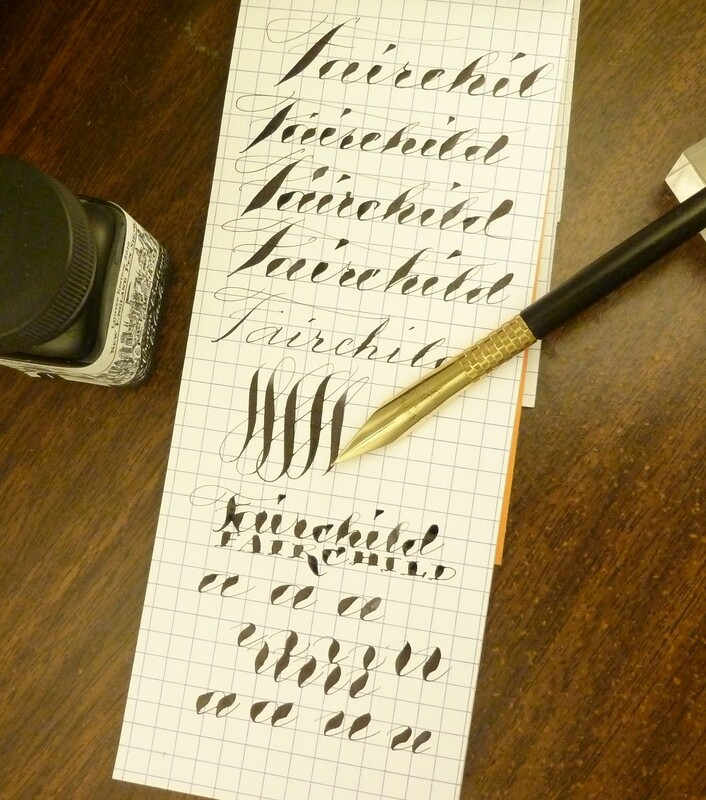 7 pink nib. And indeed it is very fine and extremely flexible. You'll see very fine hairlines and impressively broad downstrokes. Very good condition with no chips or cracks, some trim wear, minor surface scratching. Name 'Betty Jane Lloyd' in barrel. Restored and working with a new sac installed. Length about 4 1/4 inches. 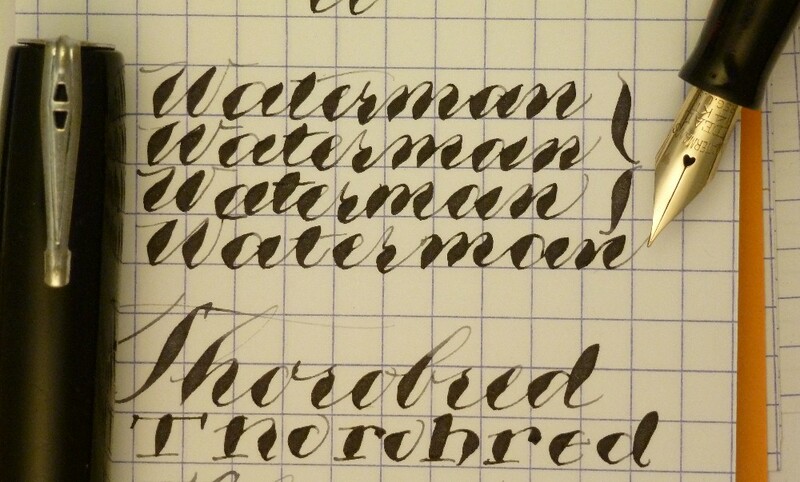 Waterman sterling overlay in the hard to find 1930s model. 'Gothic' (checkerboard) pattern. 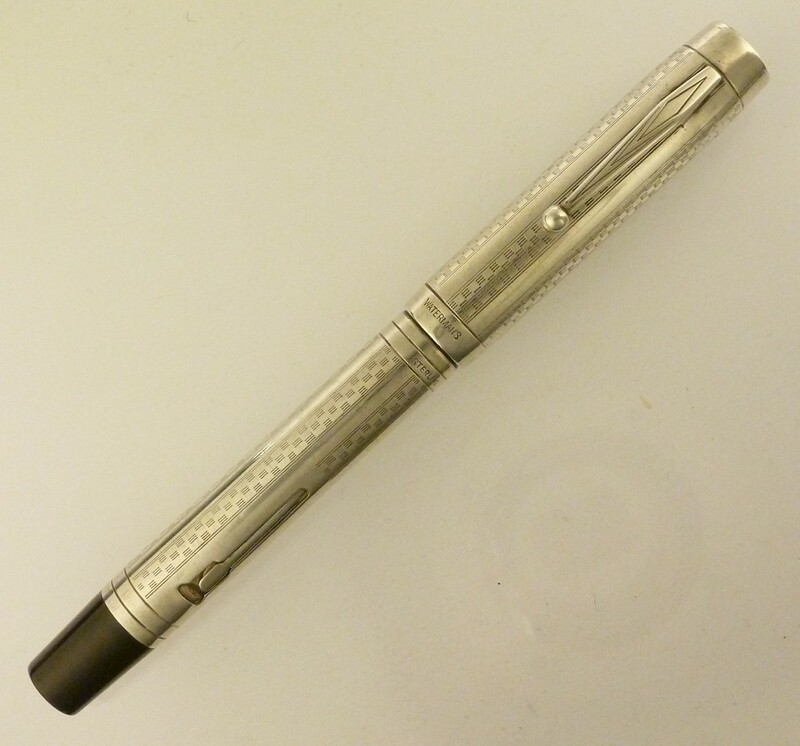 This pen is the same width as the 1920s sterling overlay 452, but is a little shorter, a little streamlined, and uses the newer style clip and lever. 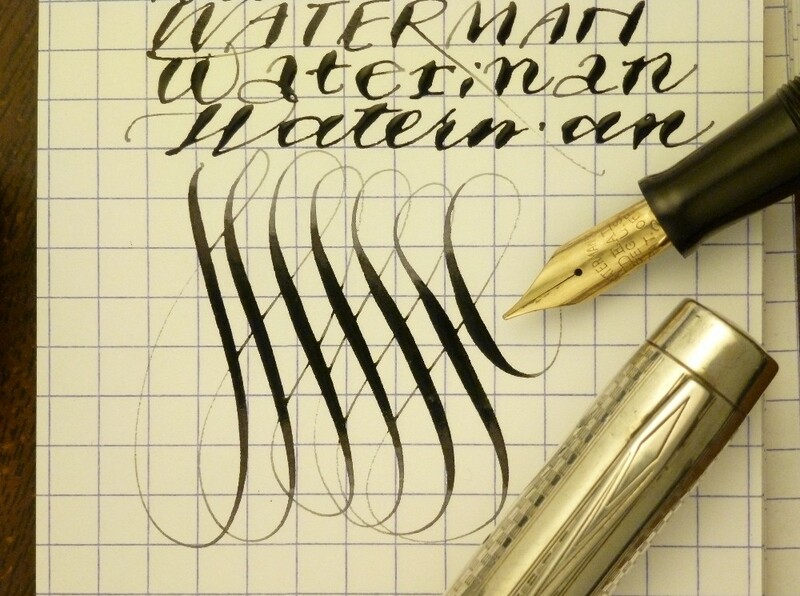 It's ergonomically better, since the shorter length improves the pen's balance with the cap posted, but unfortunately Waterman didn't make very many of them. This one was owned by Alexander F. Ormsby, a New Jersey assistant attorney general, judge, and founder and dean of John Marshall College, the predecessor of Seton Hall's law school. Very good condition with no chips or cracks, several minor nicks and scratches, and some wear to the checkerboard pattern on one side of the cap. 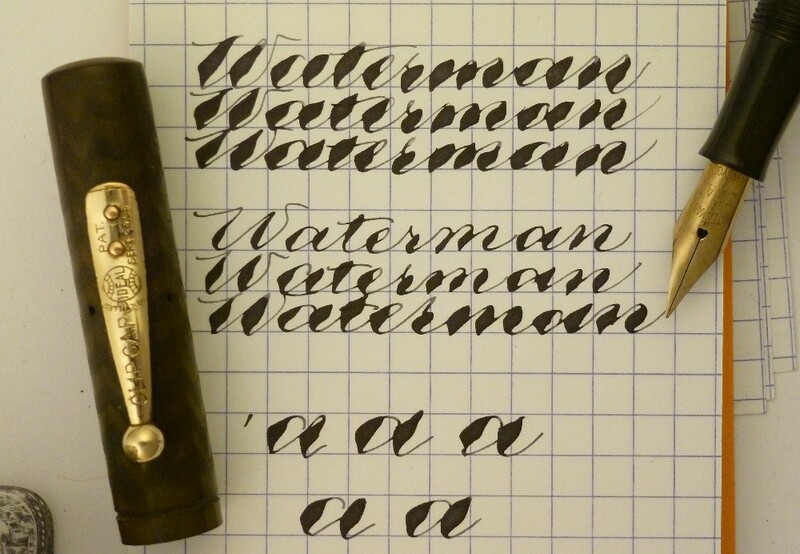 The nib is a '30s Waterman No. 2, fine to medium and fairly flexible. 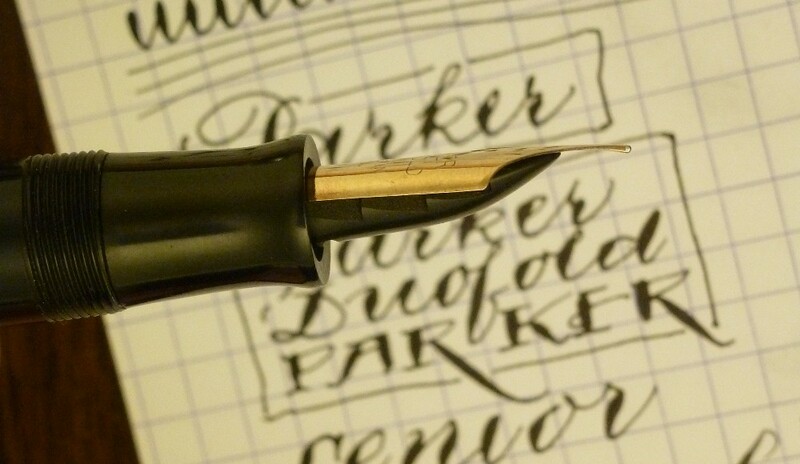 The nib has a crack coming up from the base, see photos, but this does not affect function. Restored and working with a new sac installed. Length about 5 1/8 inches. Item 1105 $450 plus $10 shipping and insurance to USA addresses, $30 for International. Email for invoice. 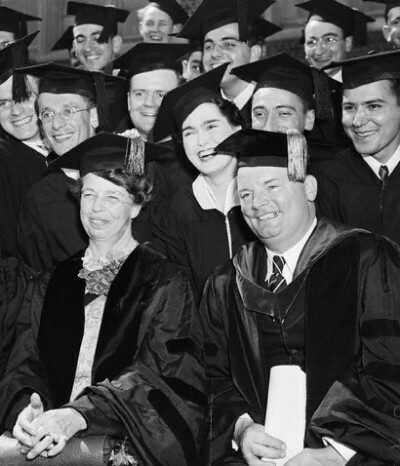 Photo: Ormsby with Eleanor Roosevelt at John Marshall College's 1937 commencement, where she received a doctor of laws degree. She wrote about her visit in her 'My Day' newspaper column for June 17, 1937, here. 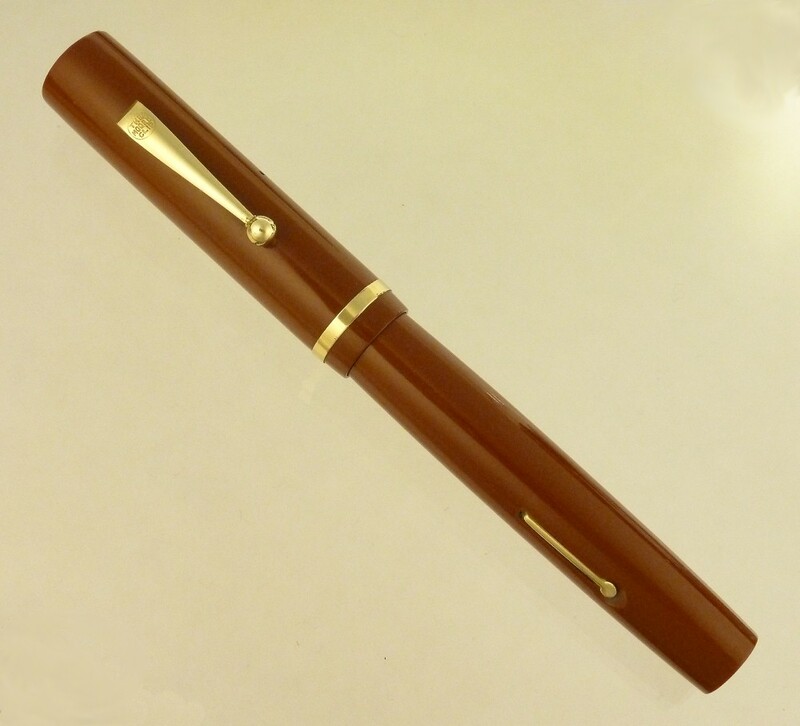 Short Waterman Hundred Year Pen in burgundy ribbed lucite with gold filled trim. 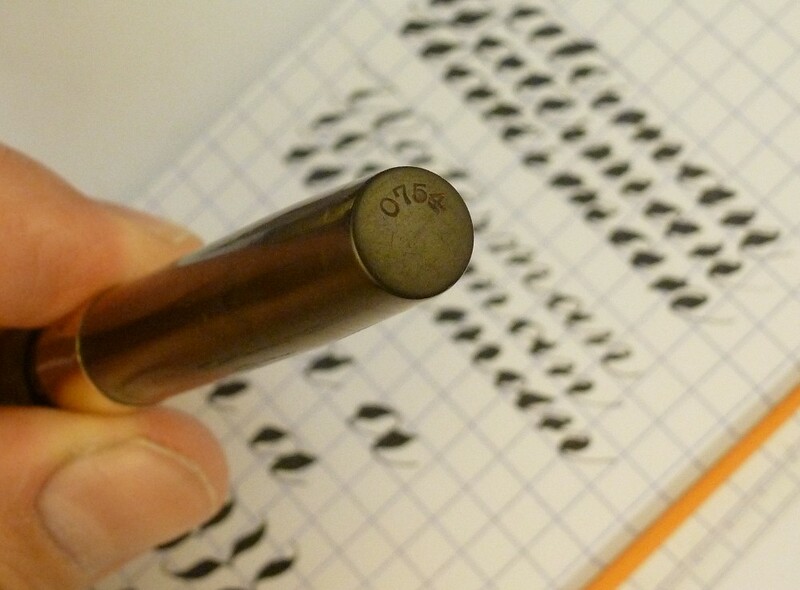 The Hundred Year Nib is extremely fine and extremely flexible. It takes very little pressure for the tines to separate, and the outer extent of the wide line is very wide. The hairline with no pressure is respectably fine. 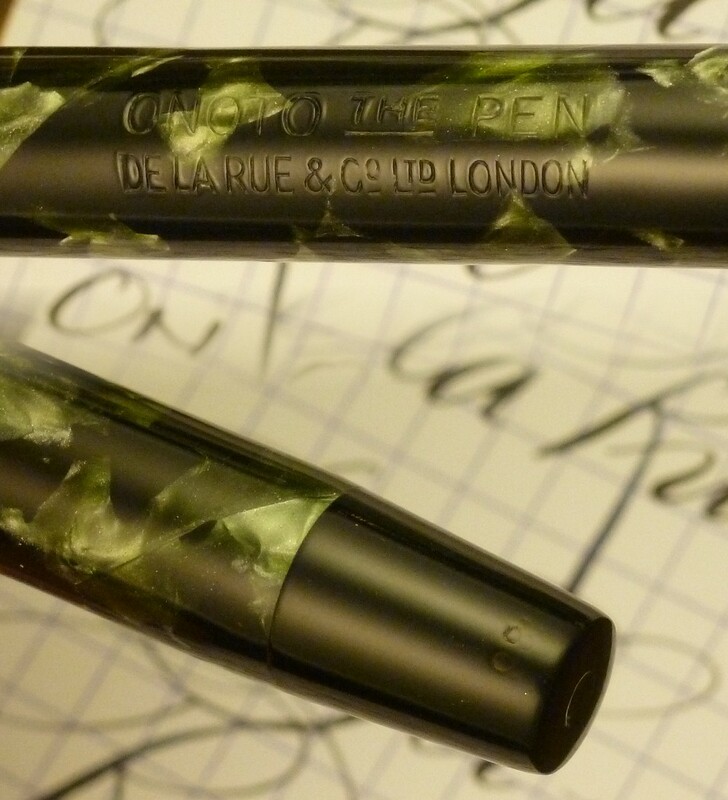 One of the most impressive fountain pen nibs I've had in terms of the sheer contrast between thick and thin, and the softness of the tines. Very good to excellent condition with no chips or cracks, minor trim wear, some imprint wear. 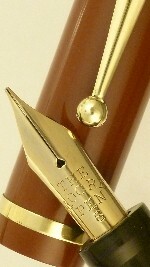 The transparent barrel end has been professionally replaced by Richard Binder. Restored and working with a new sac installed. Length about 4 5/8 inches. 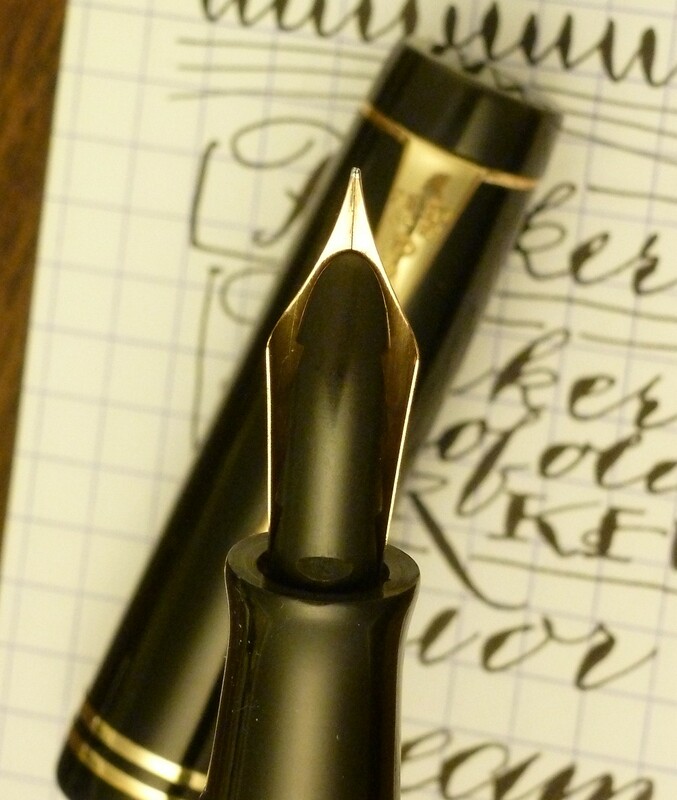 Noodler's created a new limited-production ink for the 2009 New England Pen Show -- Boston Brahmin Black -- and this was continued for 2010. 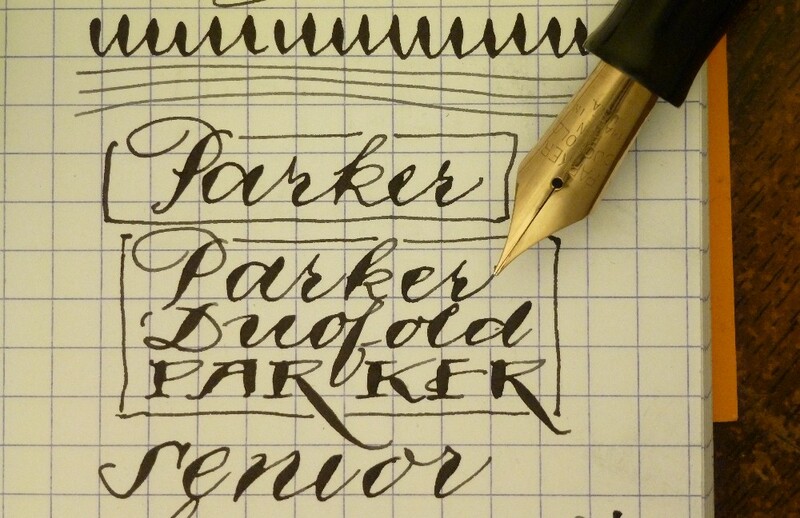 For this ink Nathan Tardif found a collection of vintage fountain pen inks. 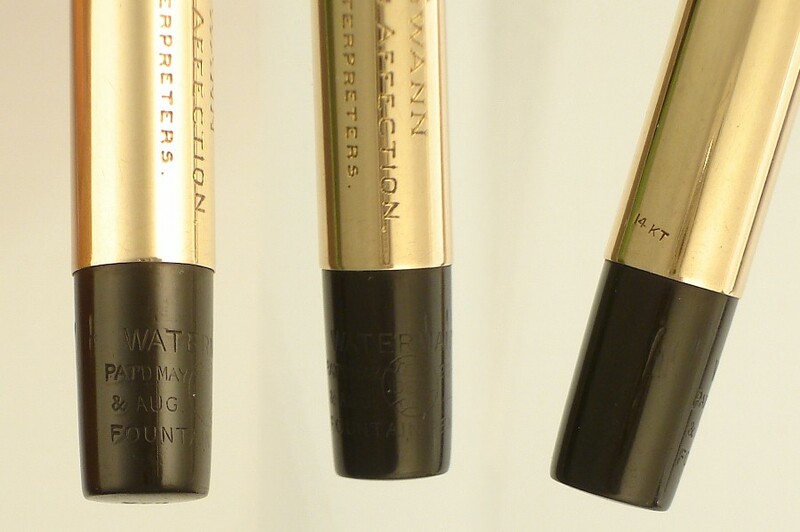 Unlike most old ink, this collection's individual bottles had been sealed to prevent evaporation. 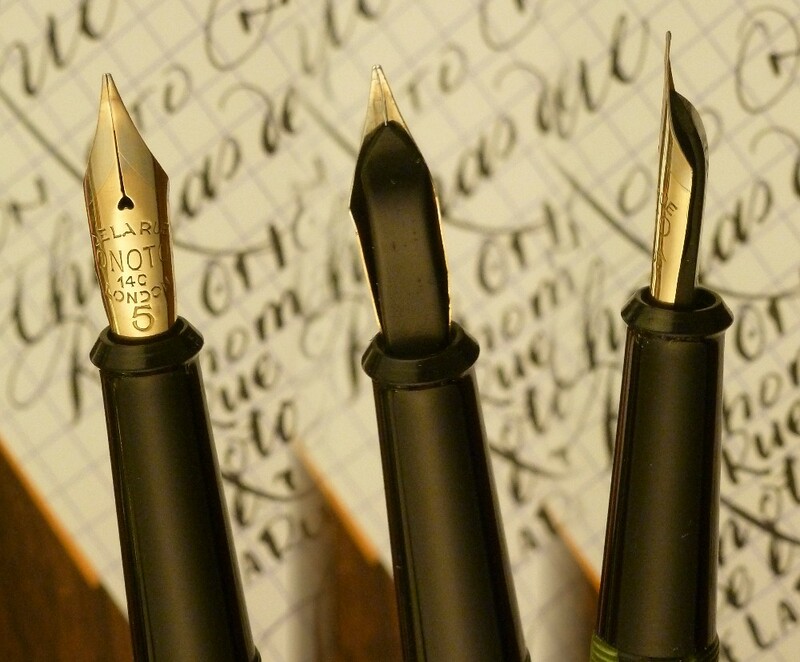 They were therefore an accurate sample of old ink exactly as it was intended to be sold. 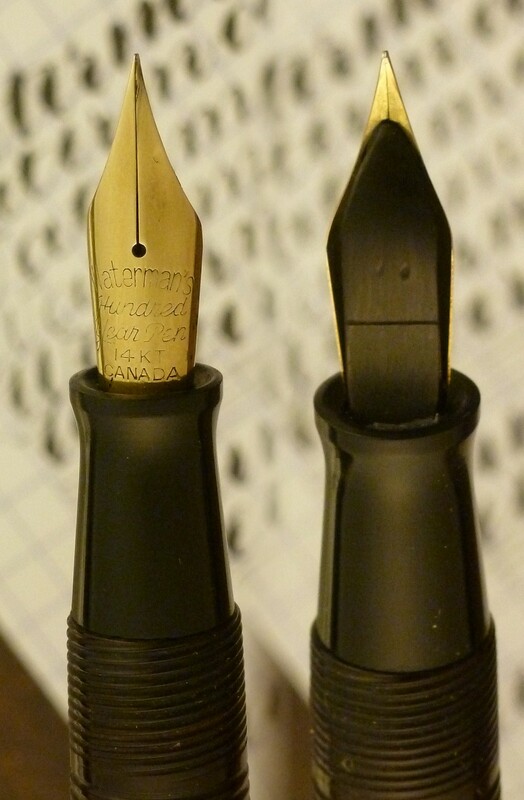 He analyzed one large maker's 1940s permanent black from this collection, and reverse-engineered it. 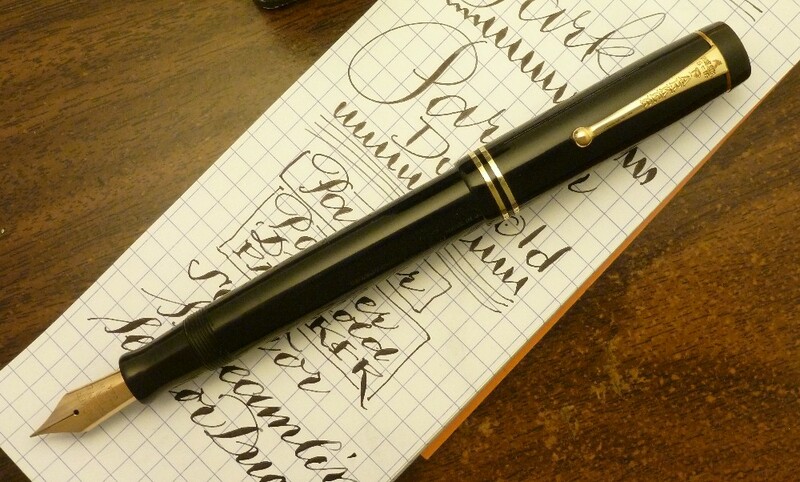 The result is and intense black ink, just like vintage, but without having had to withstand the rigors of long-term storage. 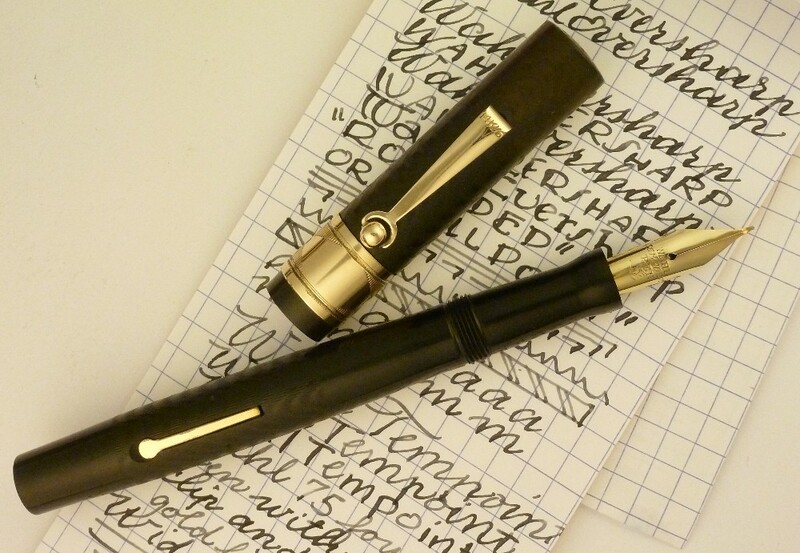 It's just like buying 1940s ink, but buying it now, today---vintage ink for the modern fountain pen user. 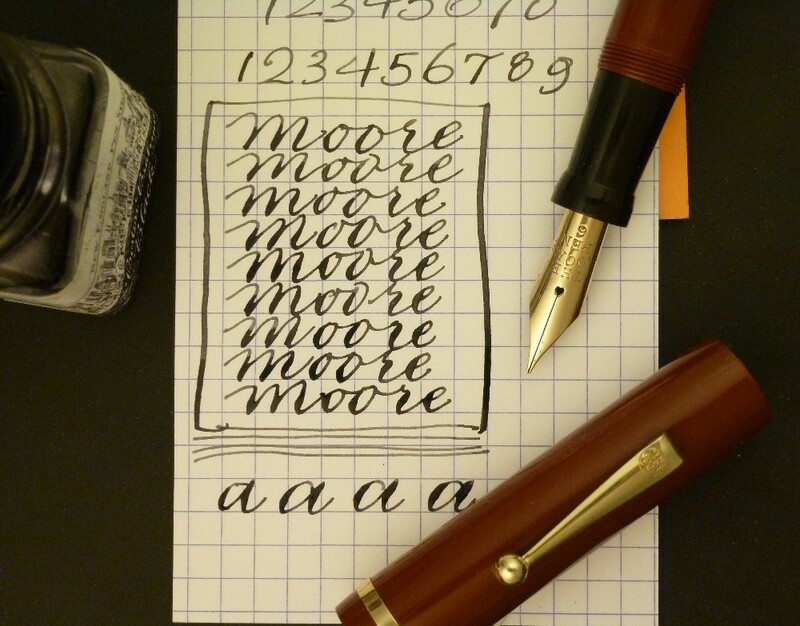 It does not have the 'bulletproof' qualities of Noodler's normal modern inks, but is rather just as permanent as '40s inks were. 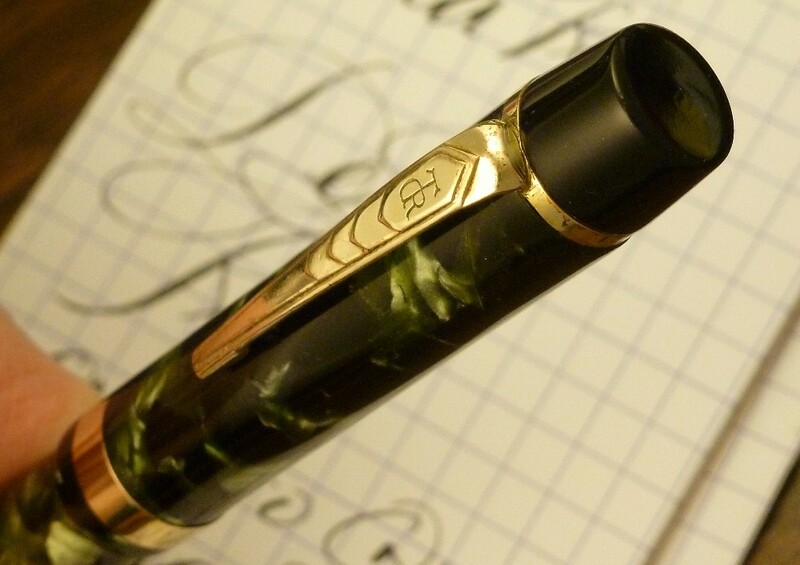 It's nice and thin, flowing easily through fountain pens, but nevertheless has good color. Nathan made 288 bottles, two hundred of which were given out to show attendees. The remainder we're selling to help support the show. One-ounce bottle with Pier Gustafson's special catfish-caught-in-the-Big-Dig label. 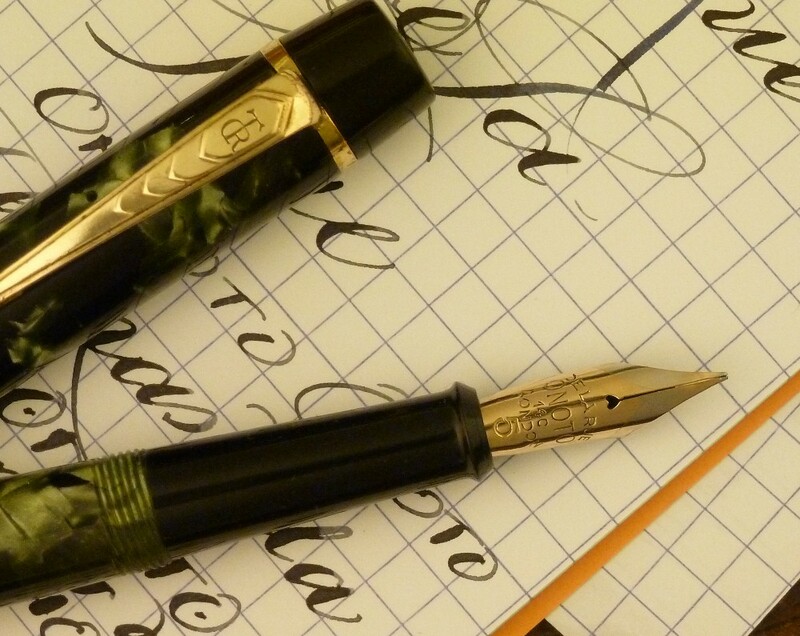 Reprising the special ink sold at the New England Pen Show in 2005, Noodler's formulated a new Limited Edition Boston Brahmin Blue for the 2006 show. The '06 Boston Brahmin Blue is an all-new color, but just like its predecessor it was specially designed for extra feathering-resistance. 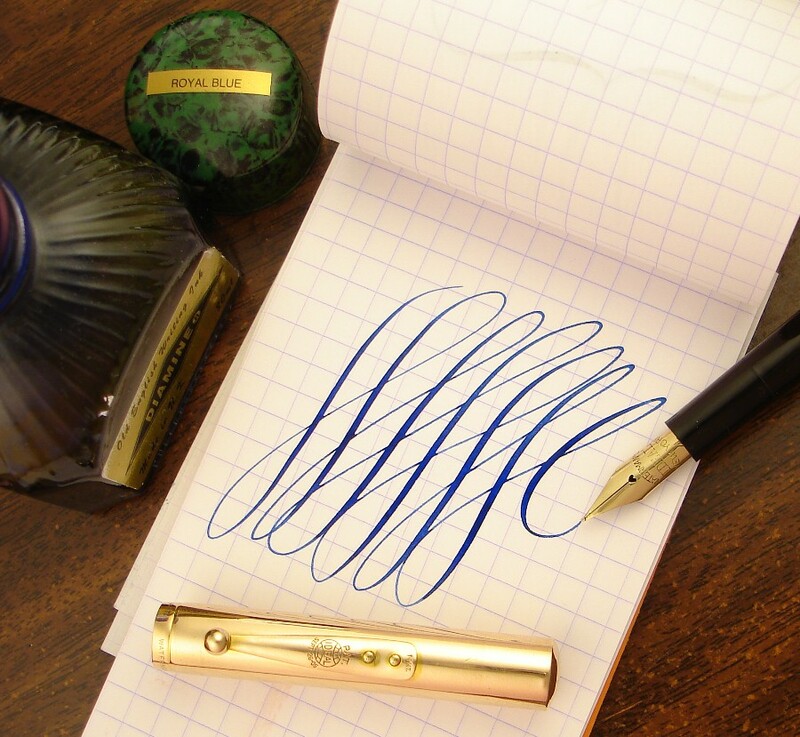 It's a bright, clear blue, perfect for everyday writing, yet distinctive. Each one-ounce bottle carries artist Pier Gustafson's special label: the Noodler's catfish goes in one end of the newly depressed Central Artery and emerges from the other, with the harbor-front skyline in between. 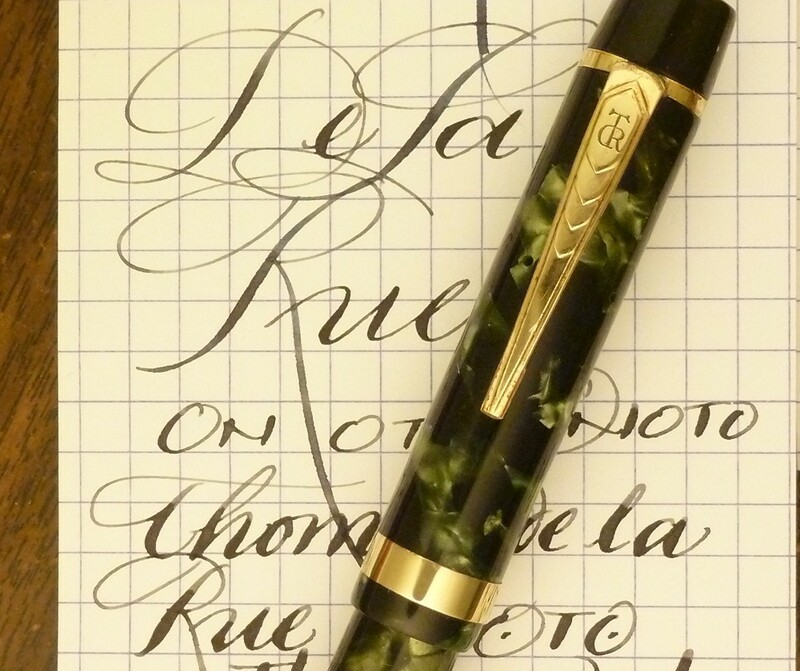 The ink was sold at the show, and a few of the limited number of bottles remained, so you now have a chance to obtain one, and try it out for yourself. To order, click on the Paypal 'Buy Now' button, or email for invoice. Check my eBay listings here.